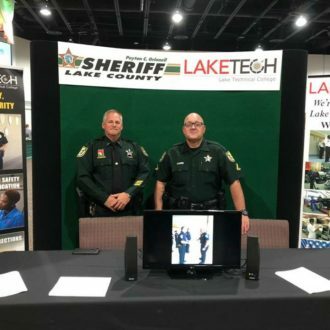 Ready for the Career Fair? 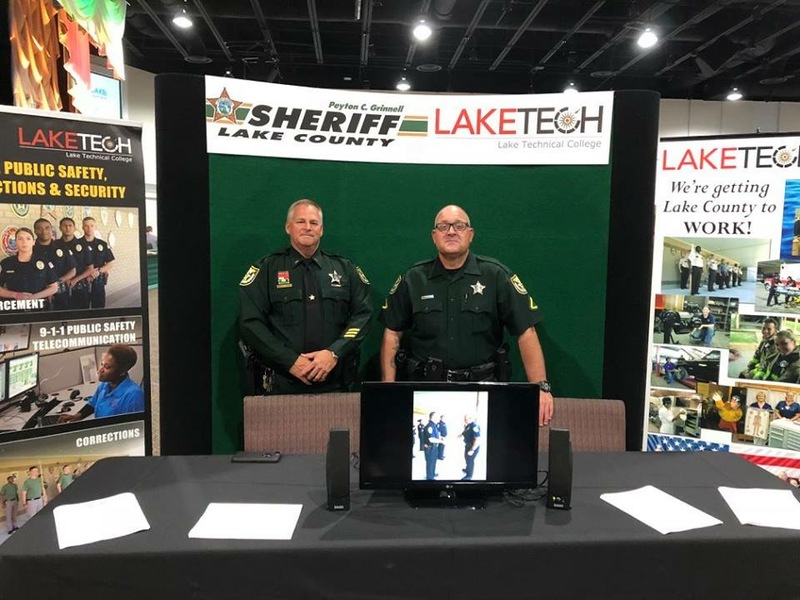 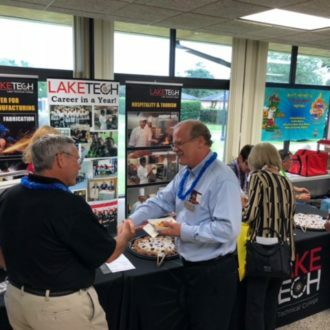 Lake Tech’s Annual Career Fair is Tuesday, May 1, from 9 am until 11 am. 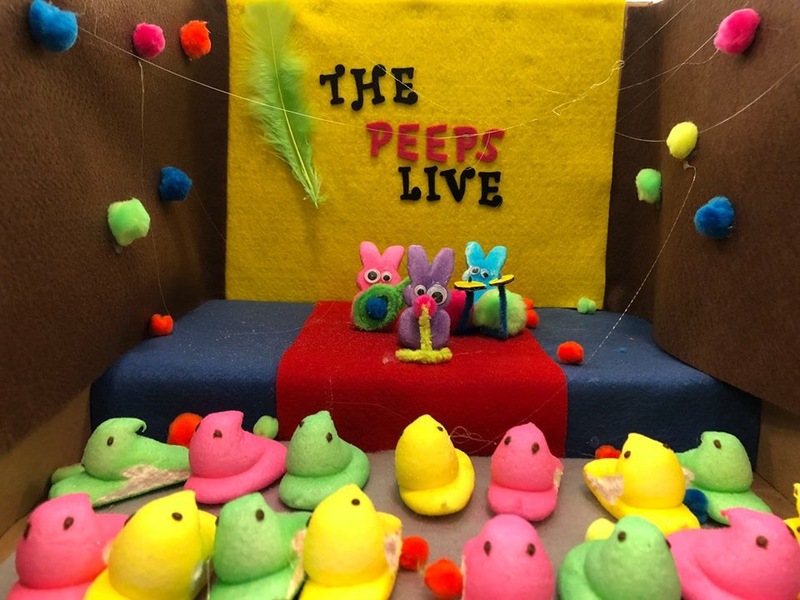 All students are invited to participate! 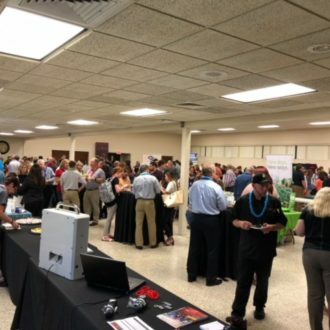 Meet people in the business and industry community and whether your students are ready for employment now or later, this Career Fair opportunity will be beneficial for everyone. 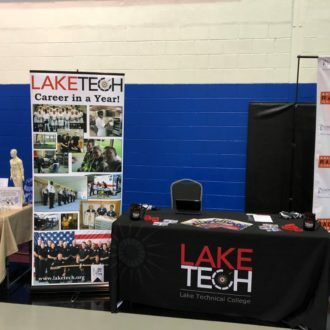 Share these videos with your students – so they will know how to “work” a job fair! 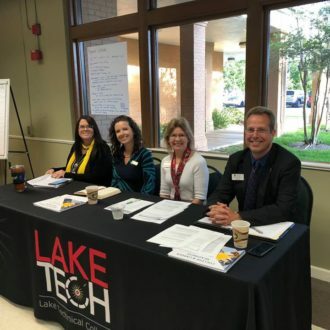 9:00 am: Keys to a Successful Job Search – Introduce the seven stages of the job search process, provide tips on how to prepare for a successful job search and discuss ways to retain your job. 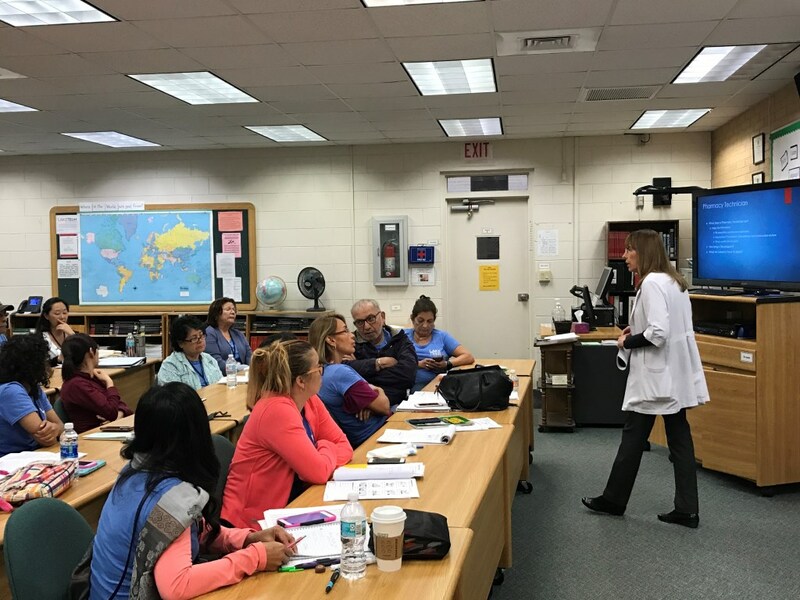 10:00 am: Know Yourself and Interview with Confidence – Review importance of being able to identify employment objectives. 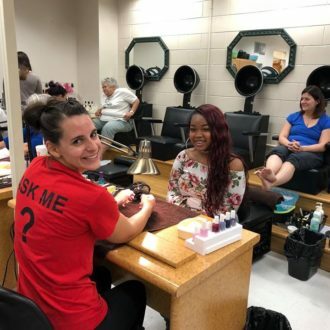 Create a strategy to market yourself. 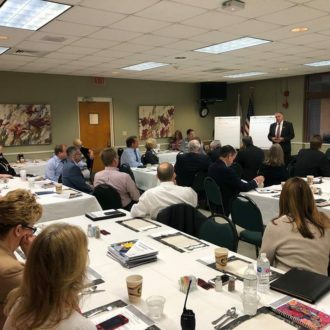 11:00 am: Sell Your Way to a Job – Examine how thinking like a salesperson is helpful to your job search. 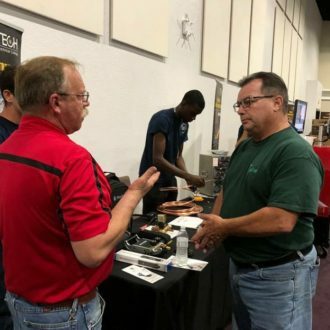 Discuss some of the necessary components and logic in trying to sell yourself. 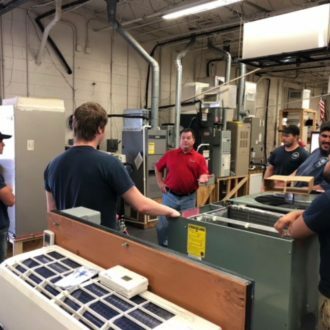 Air Conditioning, Refrigeration and Heating Technology 1 & 2 – Students from the HAVC classes had the opportunity to spend time with industry professional Resource Center Leader Ward Jenkins from Tropic Supply, Inc. to learn more about working in the field, different products, continuing education and career options after graduation. 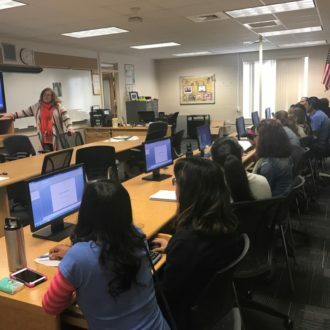 Accounting Operations / Administrative Office Specialist – This week seemed to fly by as our business students worked on a variety of requirements and new opportunities. 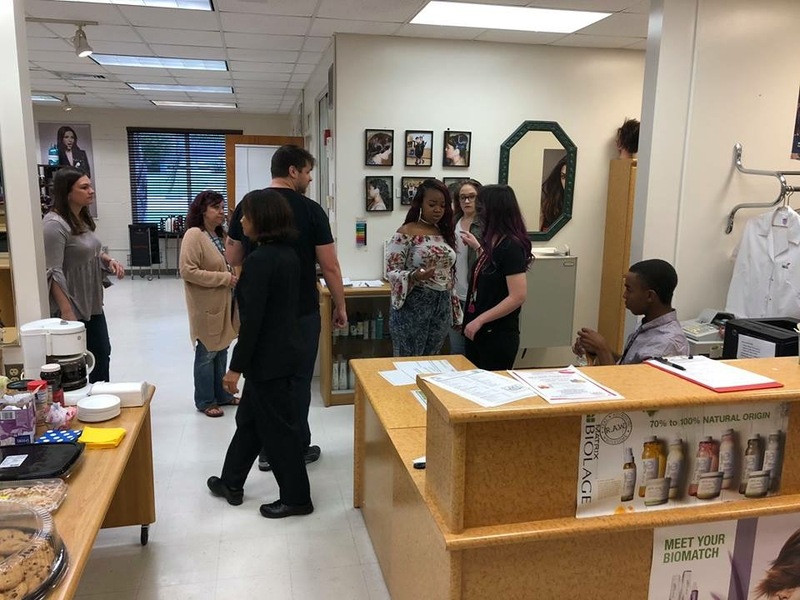 Cody Delpino gave presentations on Starting Your Own Business and the Administrative Office Specialist students had fun this week in preparation for the Administrative Professionals Day Brunch they will host for the Lake Tech staff. 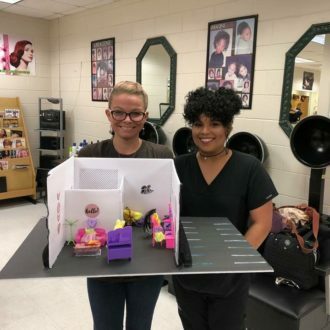 We would like to congratulate Kendra Douglas and Denisse Barajas on the completion of their program and wish them continued success for the years that lie ahead. 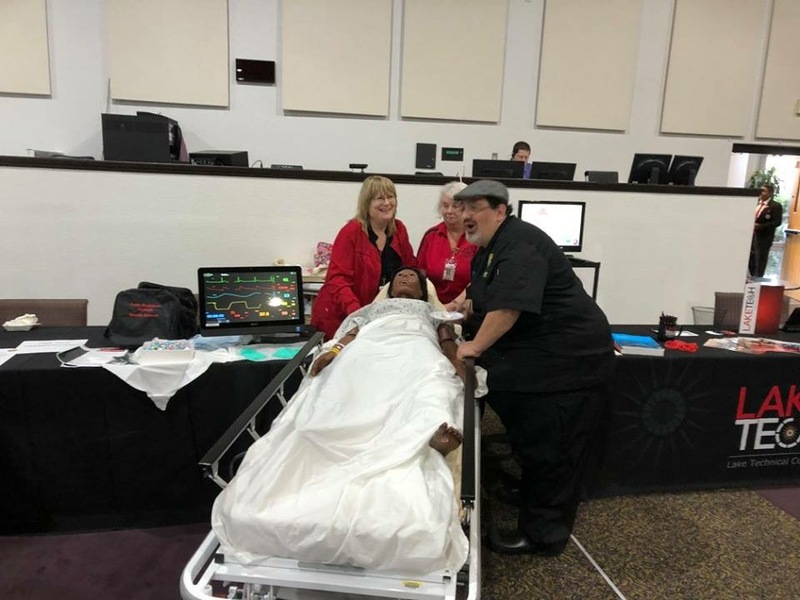 Nursing Assistant – On April 16, the nursing assisting students graduated. 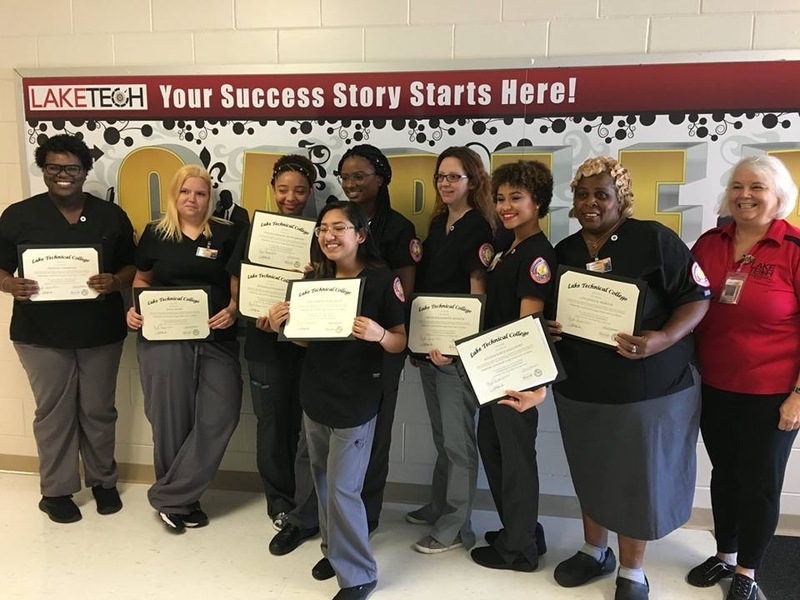 We are proud of this great group of students who are ready to enter the health care field. 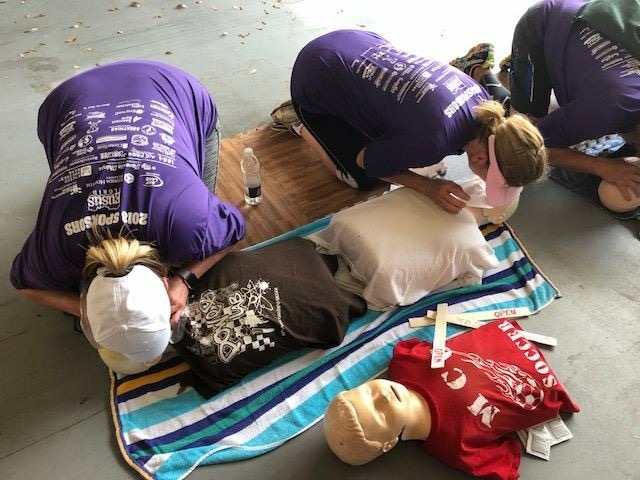 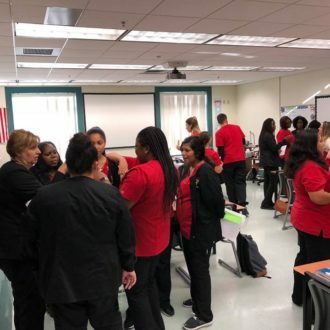 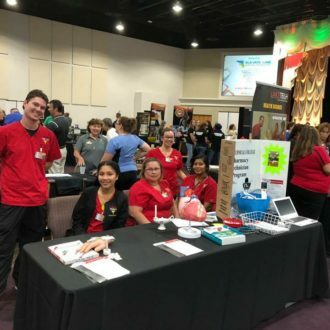 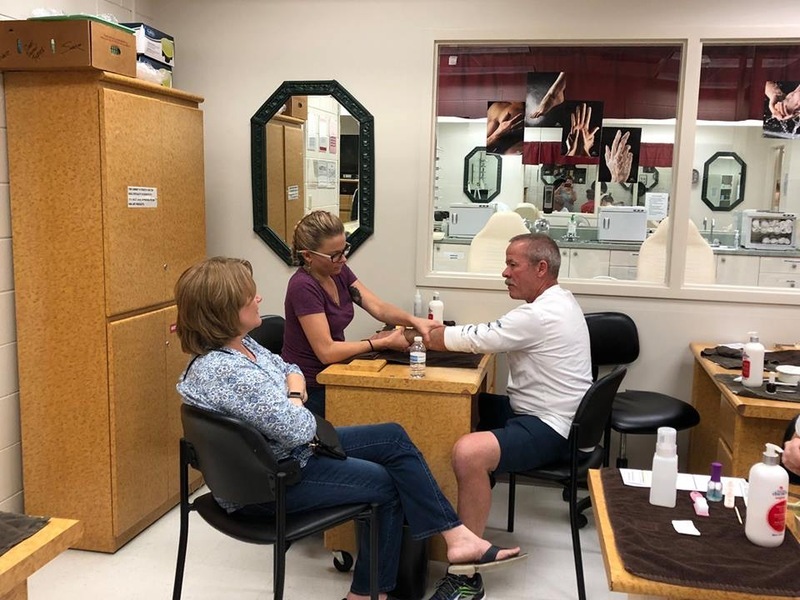 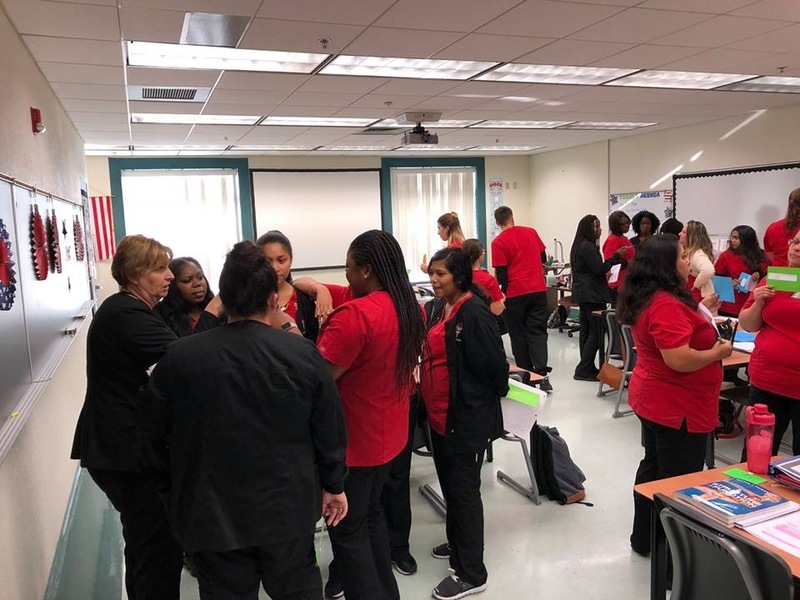 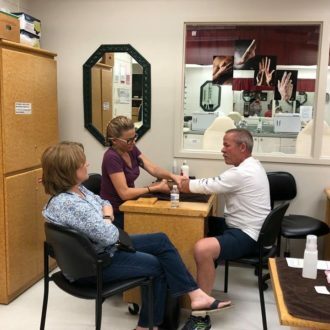 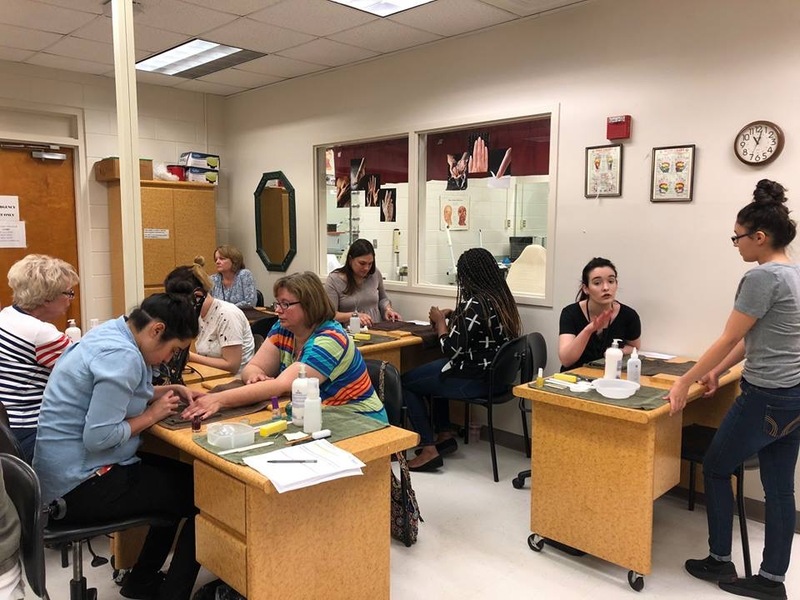 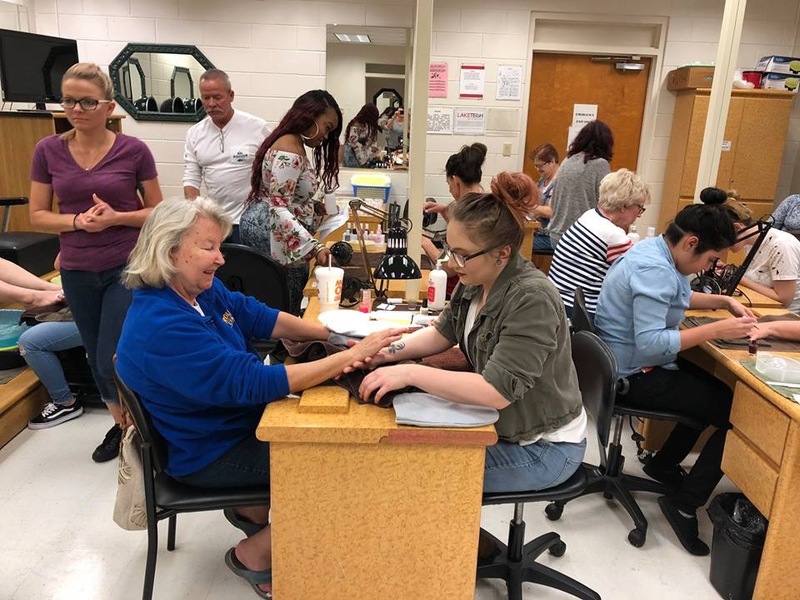 Practical Nursing, Clermont Campus – The students in the Practical Nursing program on the Clermont campus practiced learning the terminology and functions of the digestive system through a process called, “quiz, quiz, trade” with instructor Debra Hampton. 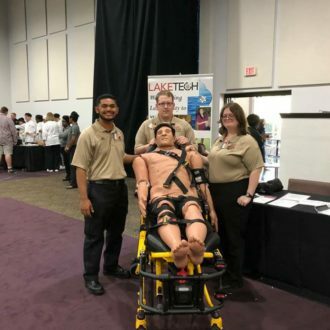 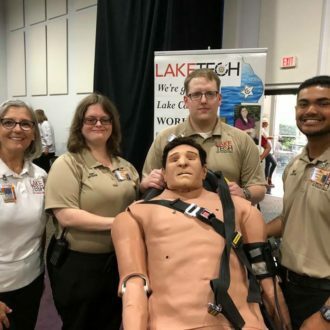 Health Summit – On April 6, a health summit was held at Lake Tech. 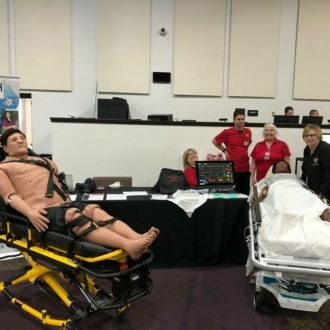 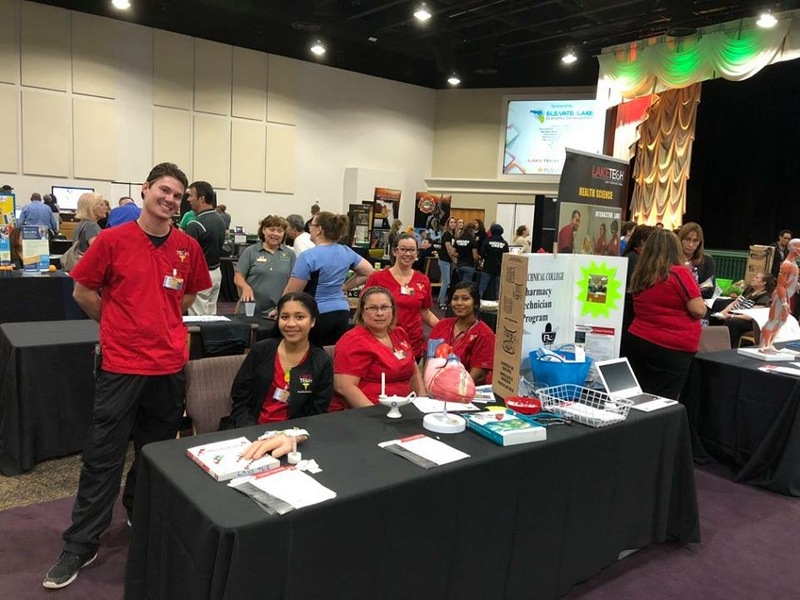 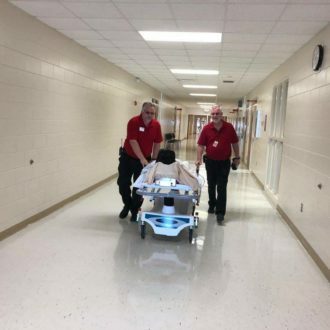 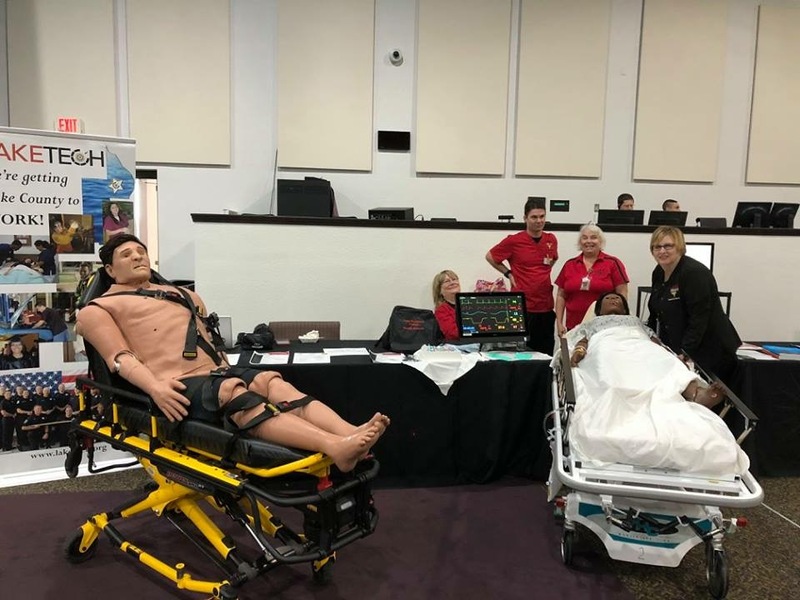 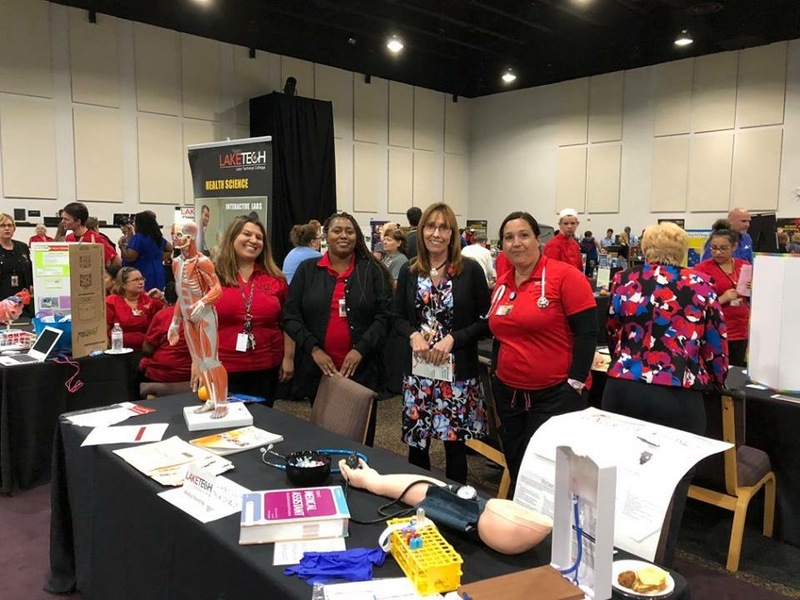 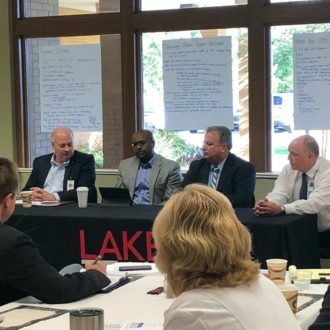 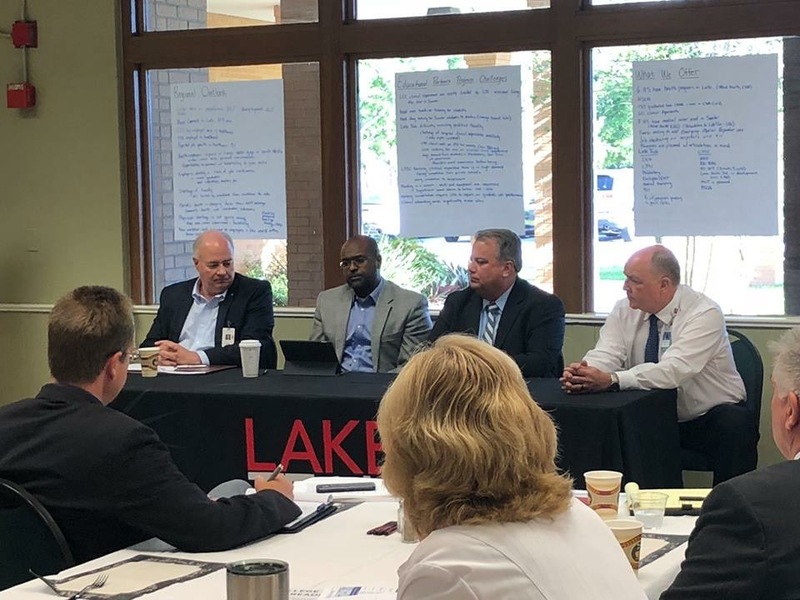 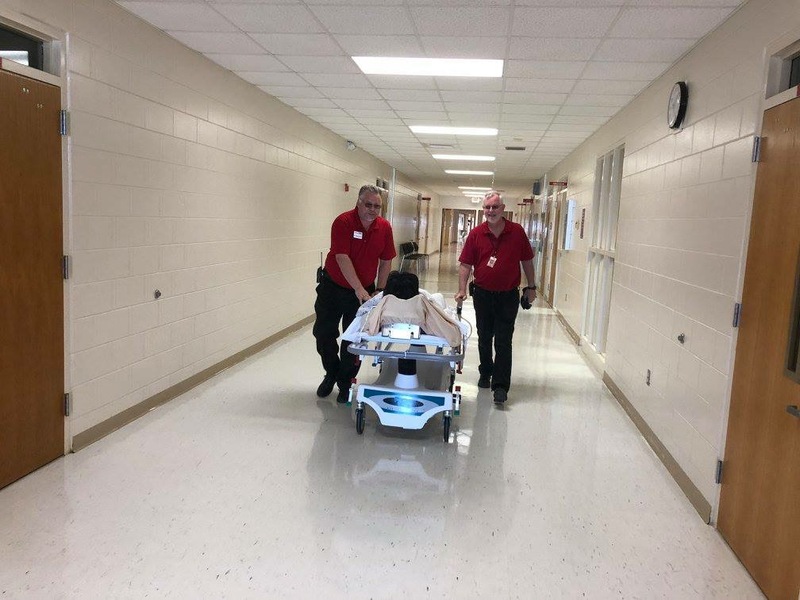 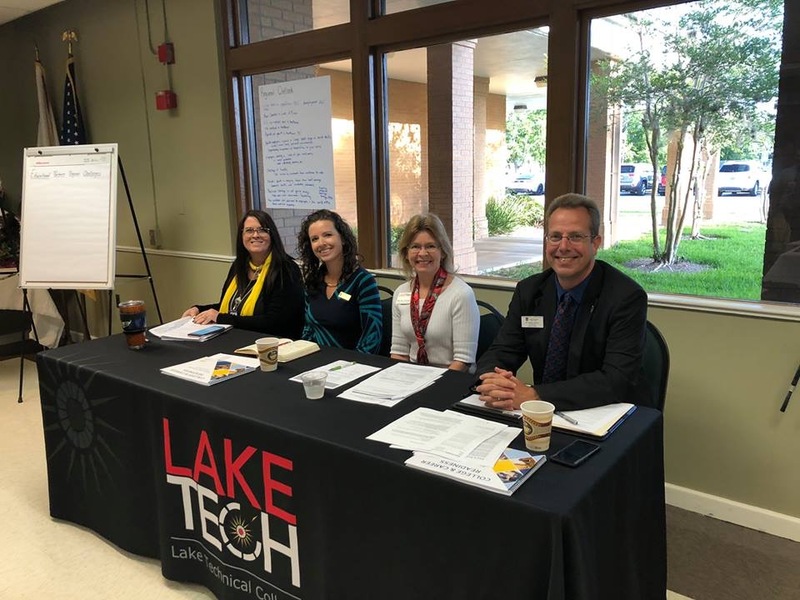 The educational partners, Sumter County Schools, Lake County Schools, Lake Tech, and Lake Sumter State College met with the health care providers in the community. 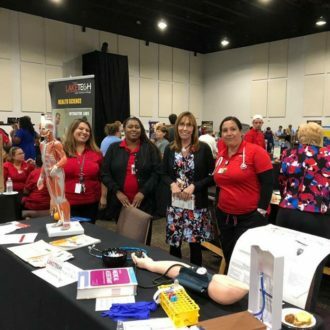 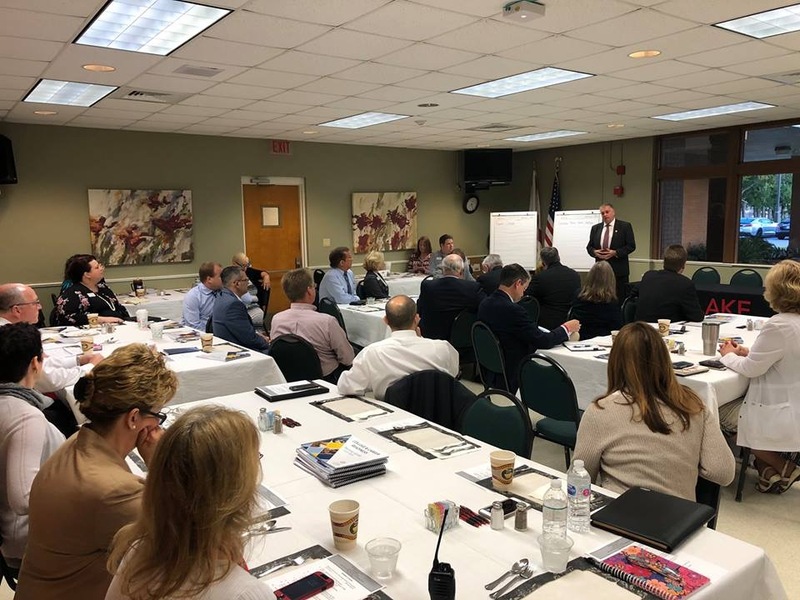 The purpose was to strengthen the partnerships and relationships between education and healthcare and to determine the future trends in the industry. 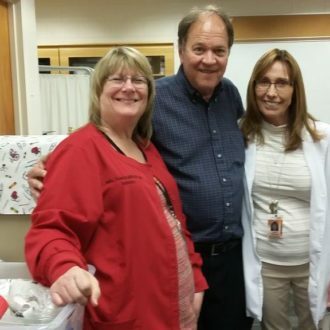 Donation – In 2015, Brian Craven donated over $3,000 of medical supplies to Lake Tech. 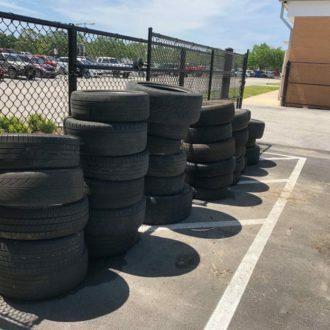 At that time, the Triangle News shared a nice story about this donation. 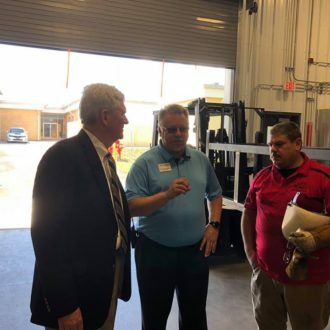 Mr. Cravan was back to visit on April 12th to donate the Hurricane preparedness materials he and his wife Pam had tucked away as Pam was on the “First to Evacuate List” for the County. 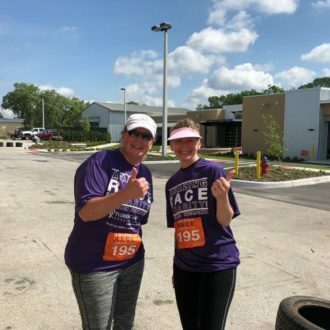 Pam waged an 8 year battle with Ovarian Cancer. 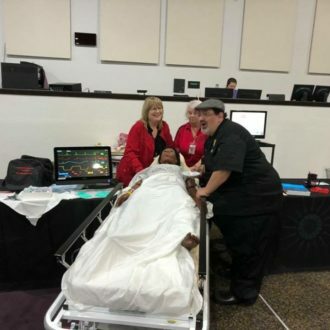 Pam lost her fight in August of 2016 but leaves a legacy behind. 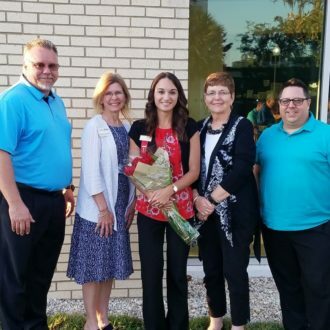 Her case was the basis of research and discovery of genetic markers that will benefit others. 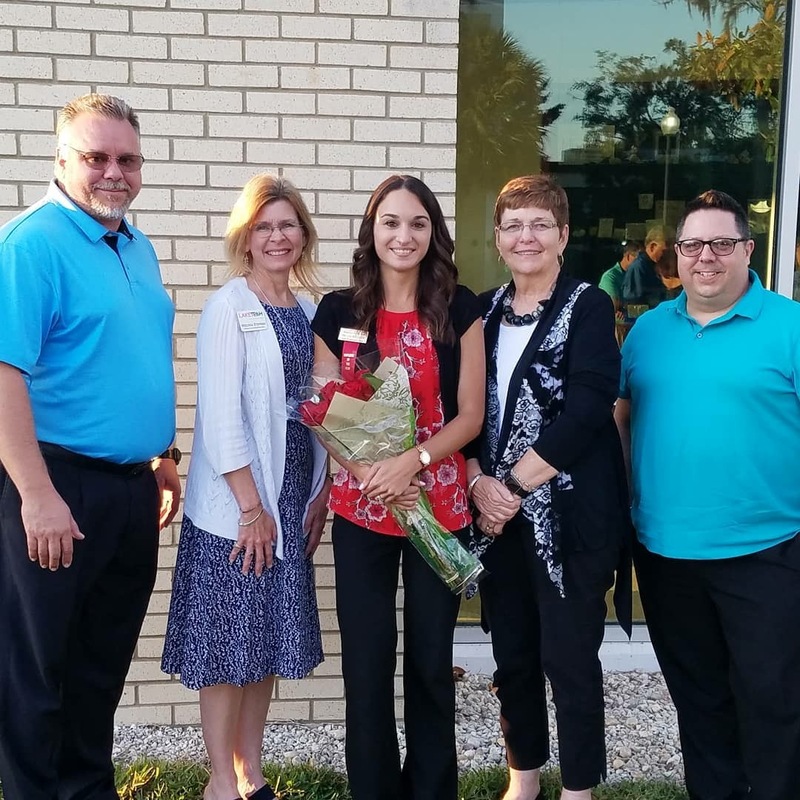 She also was an example to all of us in the compassion, strength and resilience she showed in spite of her extremely difficult journey. 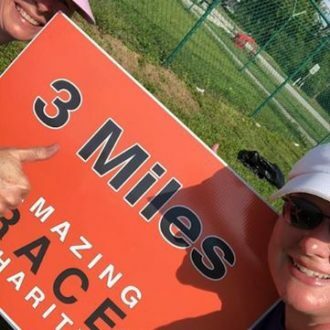 Her family continues to honor Pam through their ongoing fundraising mission to donate to cancer research. 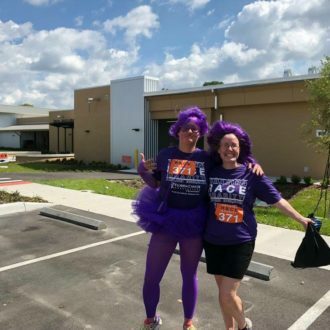 They want to improve the care of other women diagnosed with the disease. 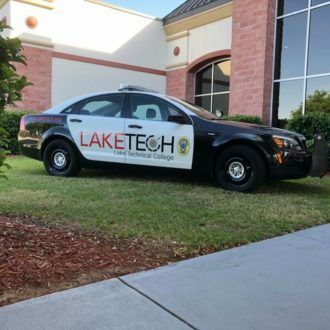 We are very grateful to the Craven family for giving to the community and to Lake Tech. 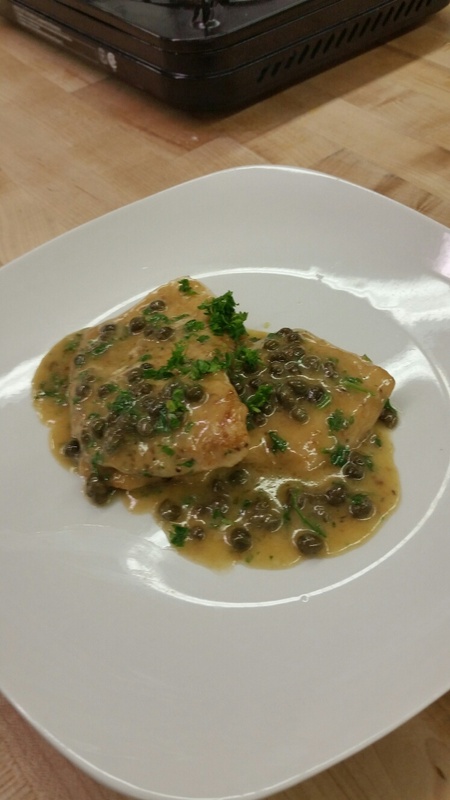 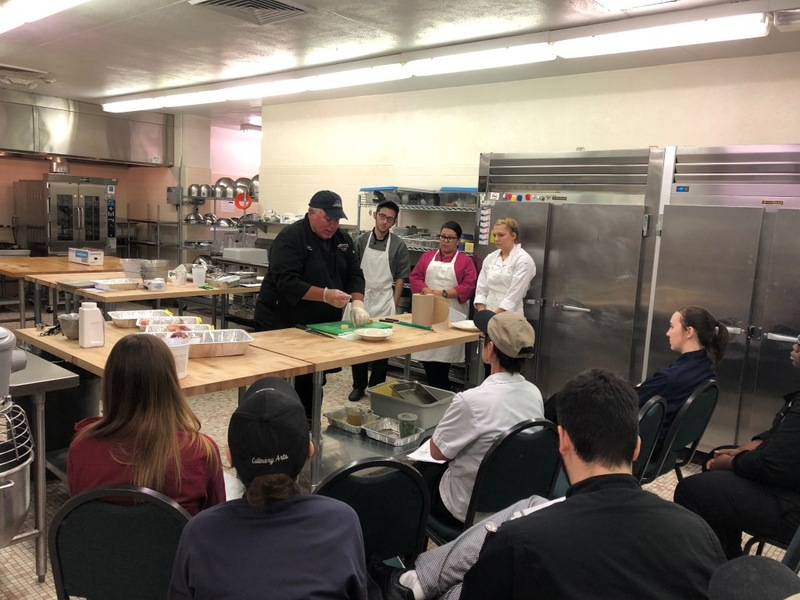 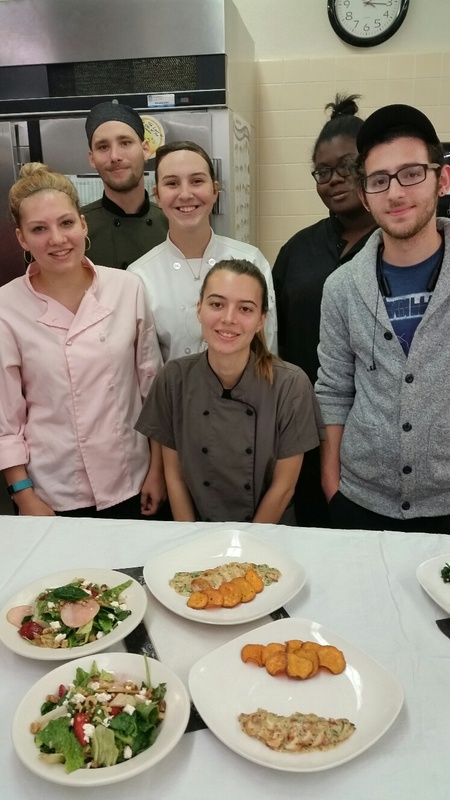 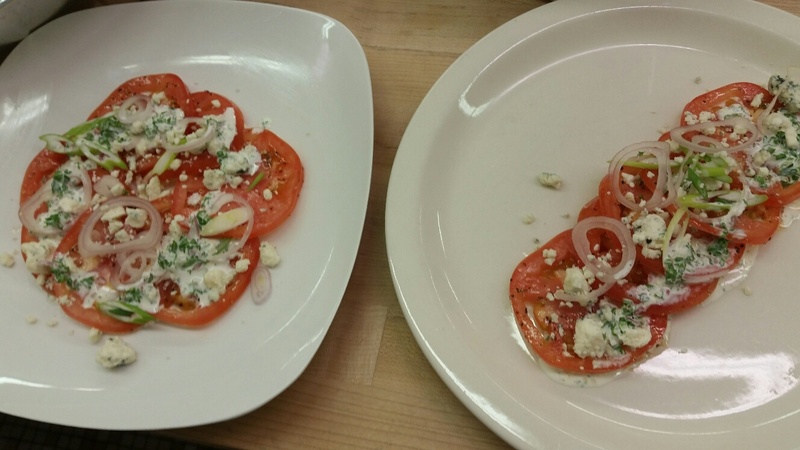 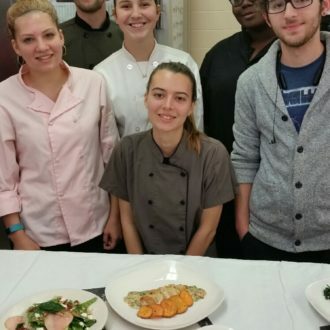 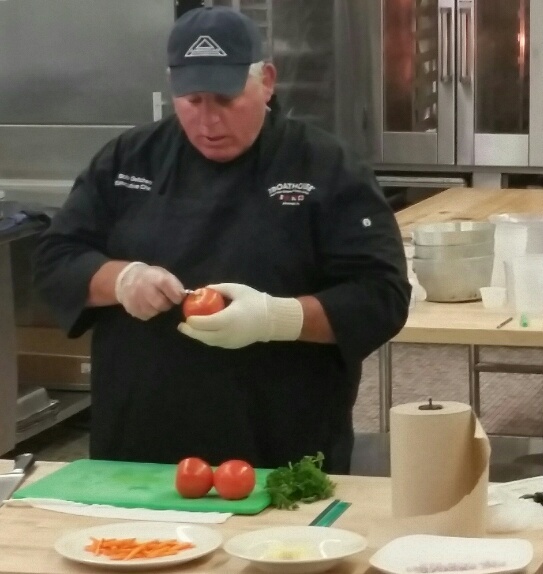 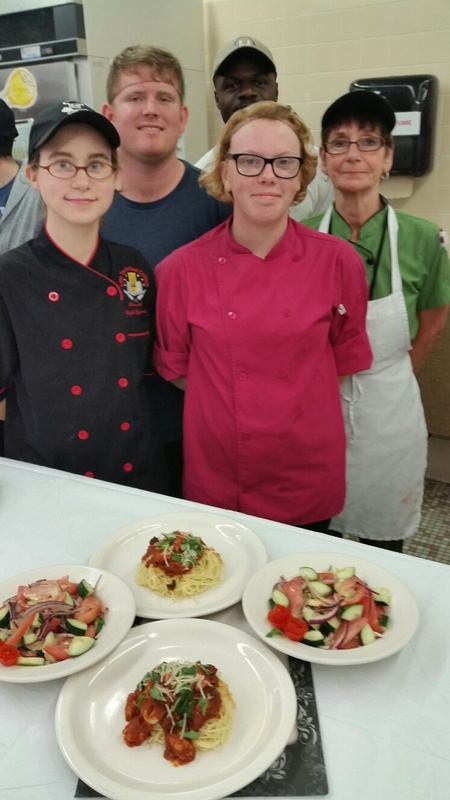 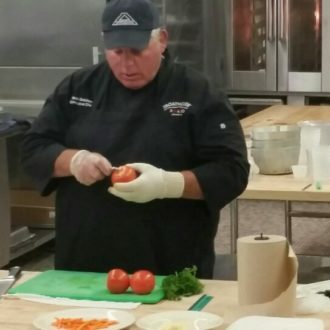 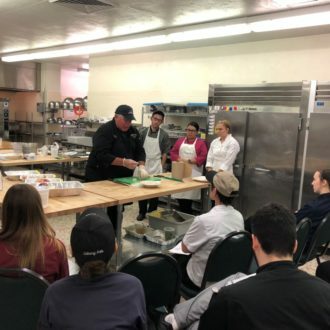 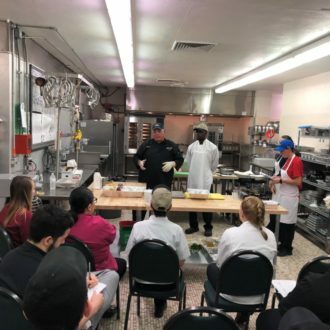 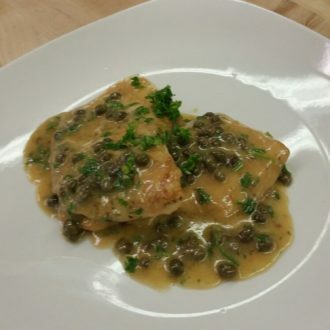 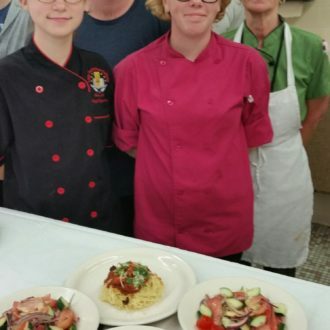 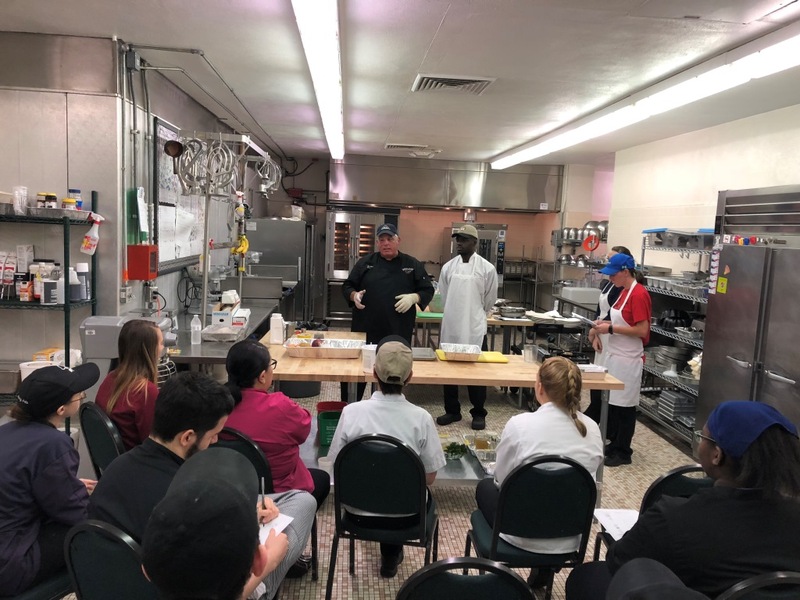 Professional Culinary Arts & Hospitality – Culinary students enjoyed a demo by Chef Getchell on how to prepare and compete in a culinary competition. 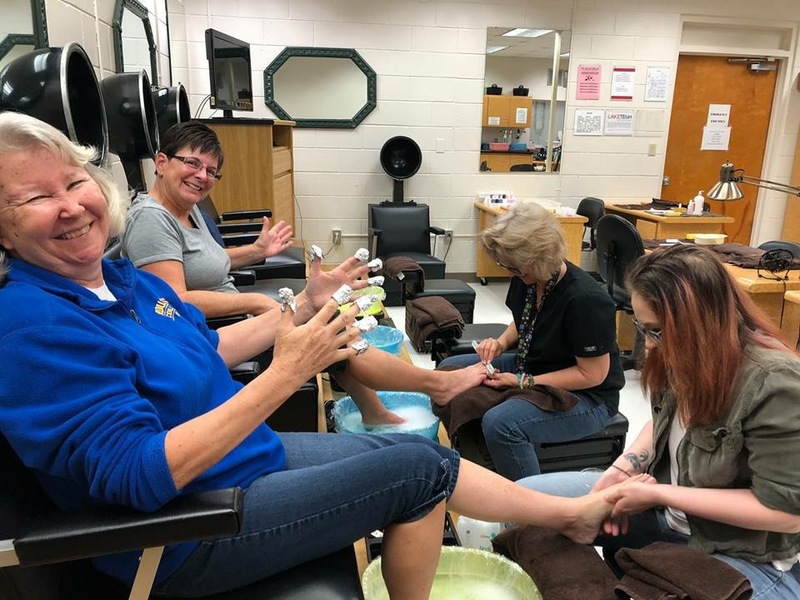 They also had a little fun in Supervision and Management class. 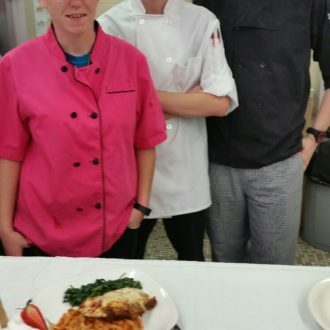 Three teams were given a whole chicken and one hour to prepare a meal to and see which plate would sell for the highest price at restaurant. 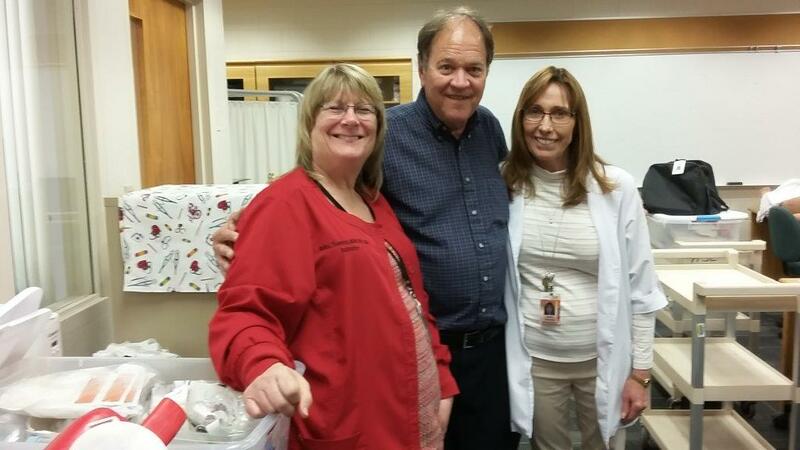 Our guest judges Dr. Crenshaw, Tom Netherton and Mrs. Bryant ate twice on Thursday! 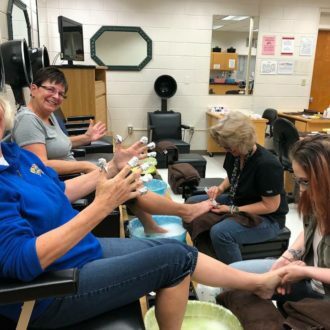 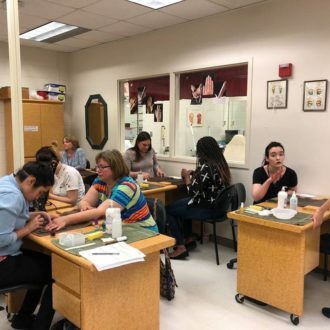 Cosmetology / Nails Specialty / Facials Specialty – Spa Day was a big hit. 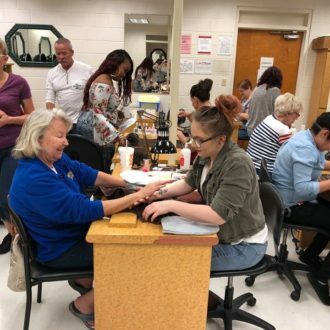 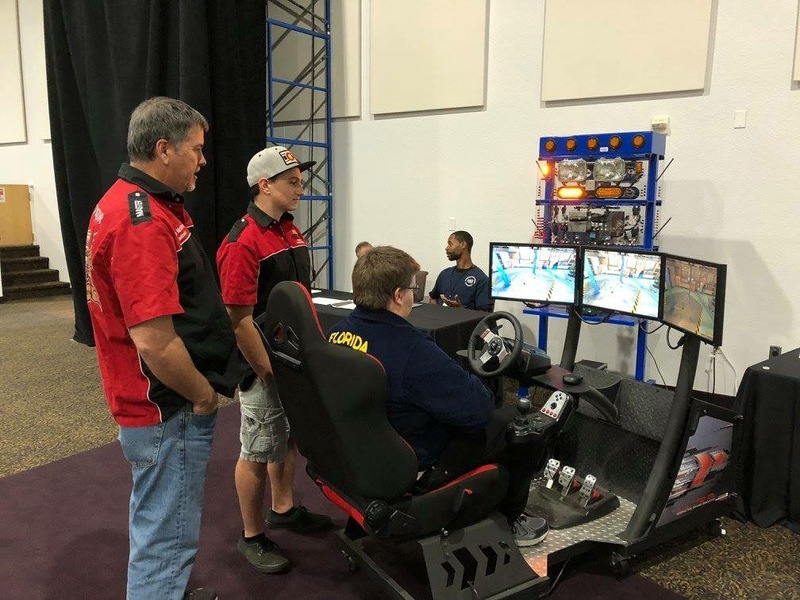 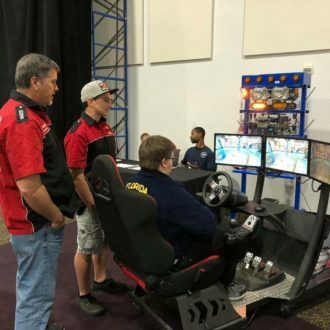 This annual SkillsUSA fundraiser not only brings in funds for the state competition, but also allows the students to practice their skills. 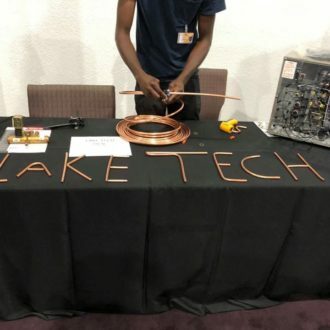 Enterprise Desktop and Mobile Support Technology / Applied Cybersecurity – This week, instructor Bob Baldeck learned that Lake Tech does not have a detailed technical document of the computer network and saw an opportunity to give students hands-on experience in network diagramming. 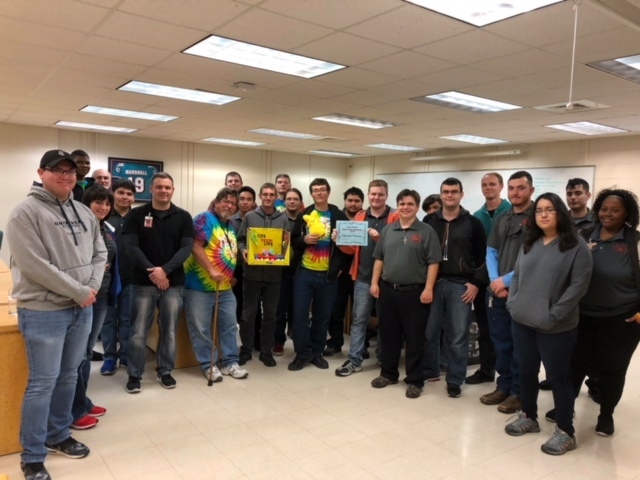 Everyone agreed that this was an excellent project for the students. 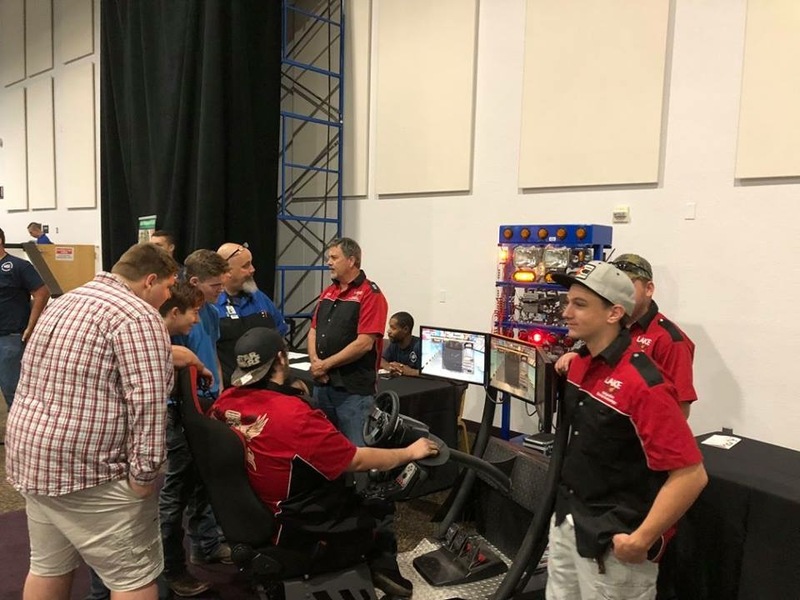 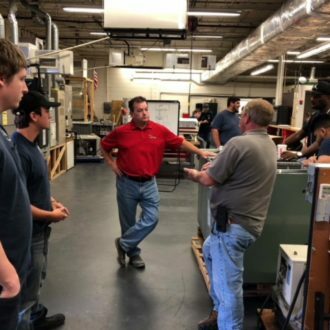 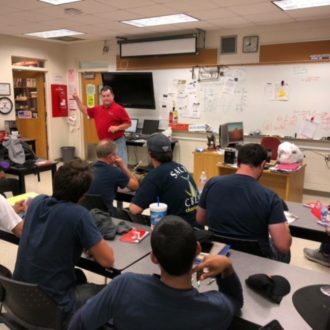 The students, under the direction of their instructors, divided into groups and started gathering information about the network through observation and by interviewing Tech Coordinator Bob Zehner. 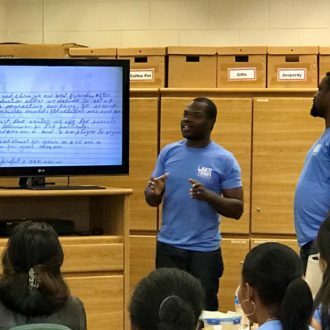 After they have gathered the needed information, they will begin to diagram the network using various software tools. 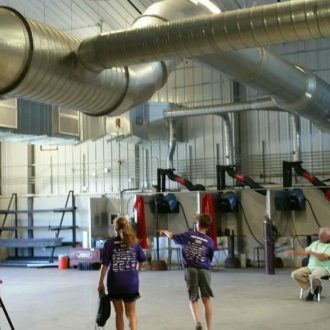 This is not only a big plus for the students, but also a valuable asset for the school. 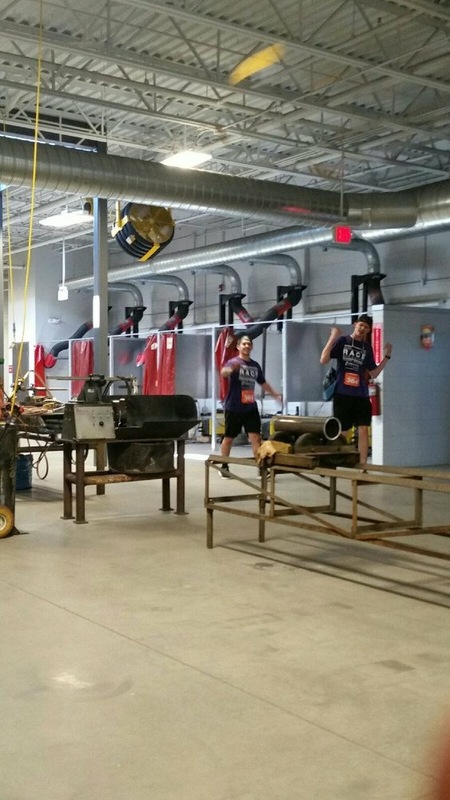 Going forward, other students will be able to engage in this activity and diagram other areas of the campus. 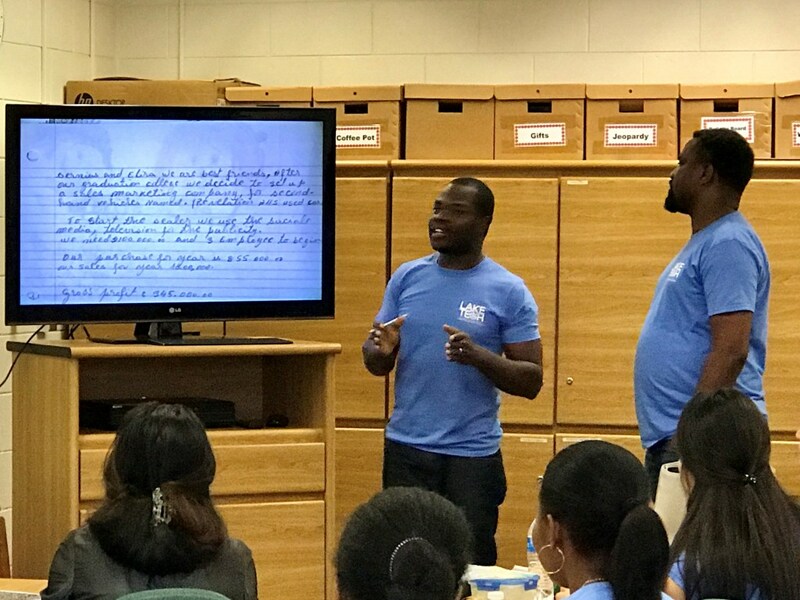 In addition, three students graduated this week and two are planning to return for Applied Cyber Security course. 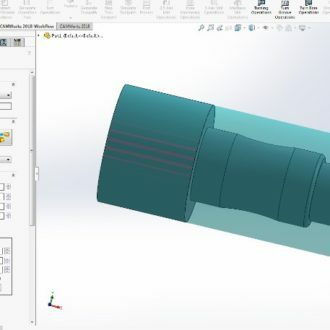 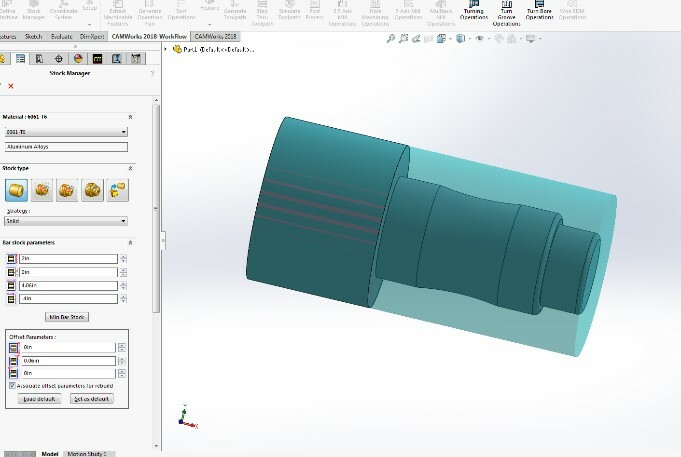 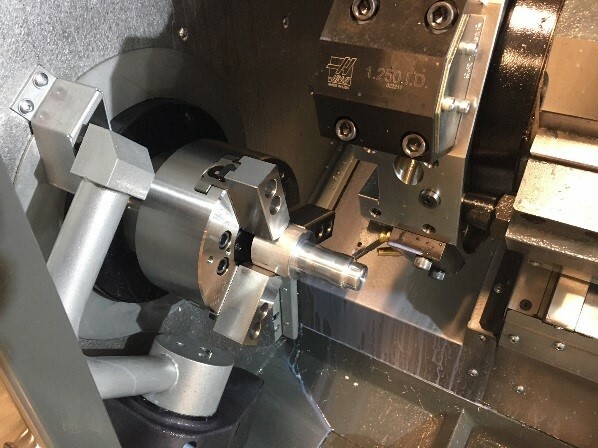 CNC Production Specialist – CNC Production Specialist students put their skills to work from start to finish. 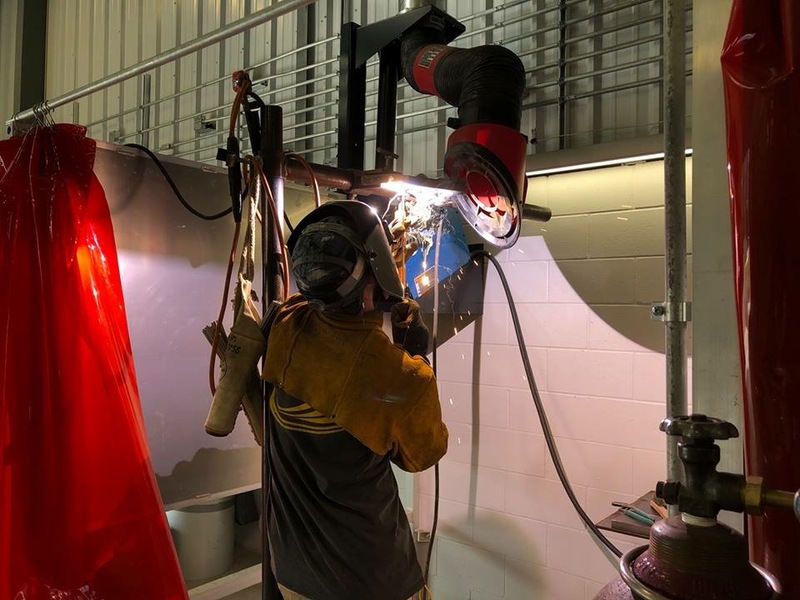 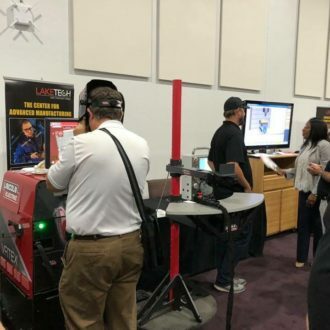 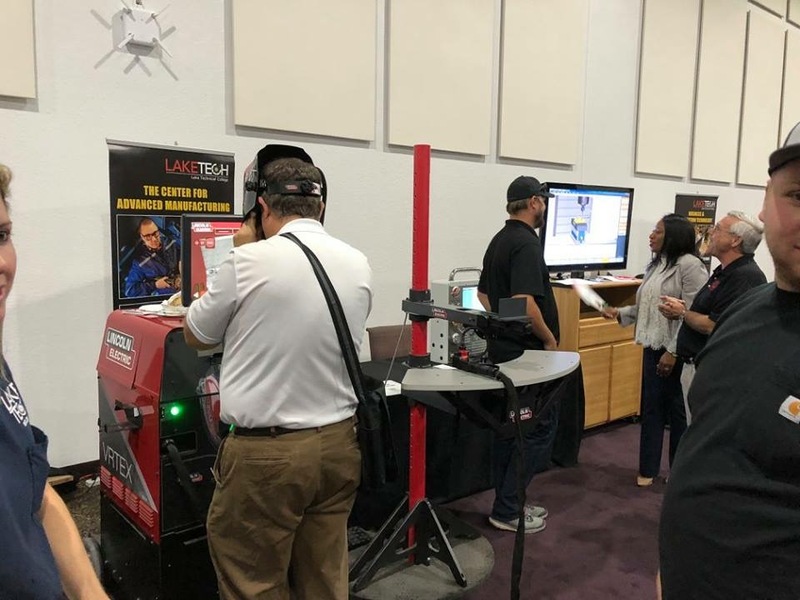 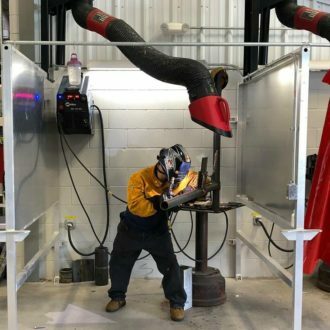 Welding Technology – April is National Welding Month. 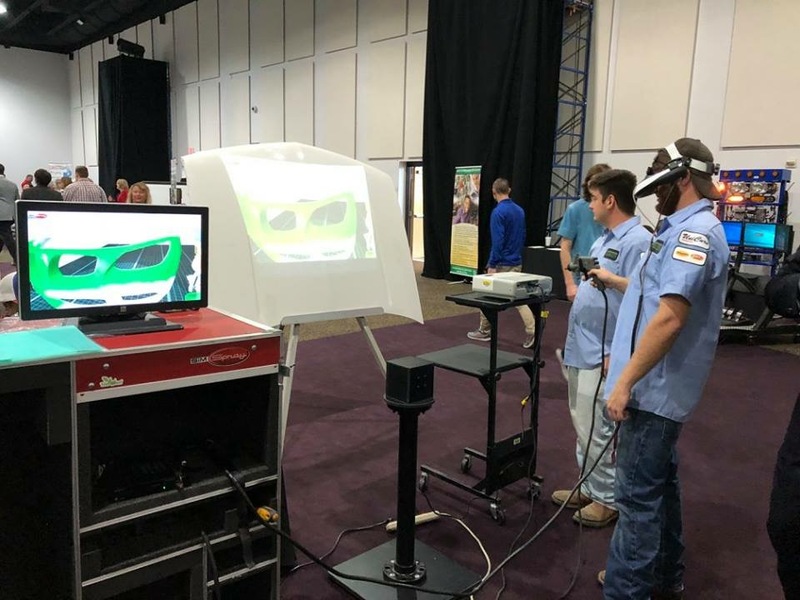 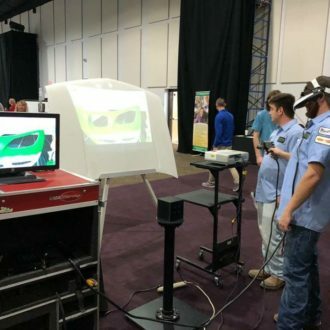 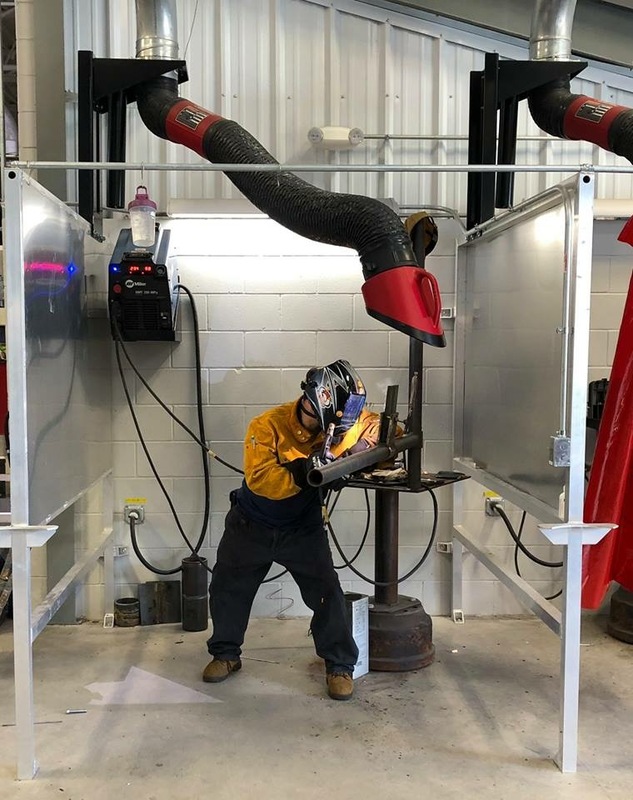 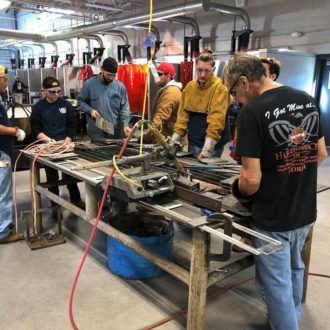 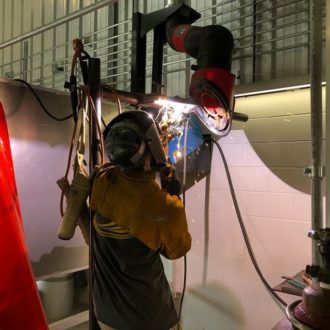 The welding industry is predicting a shortage of over 200,000 skilled professionals by 2020. 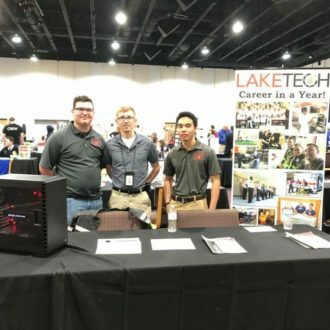 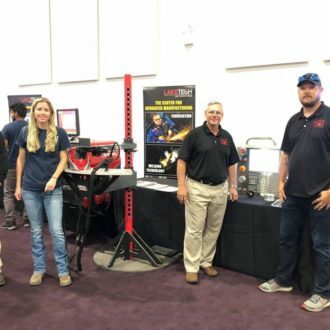 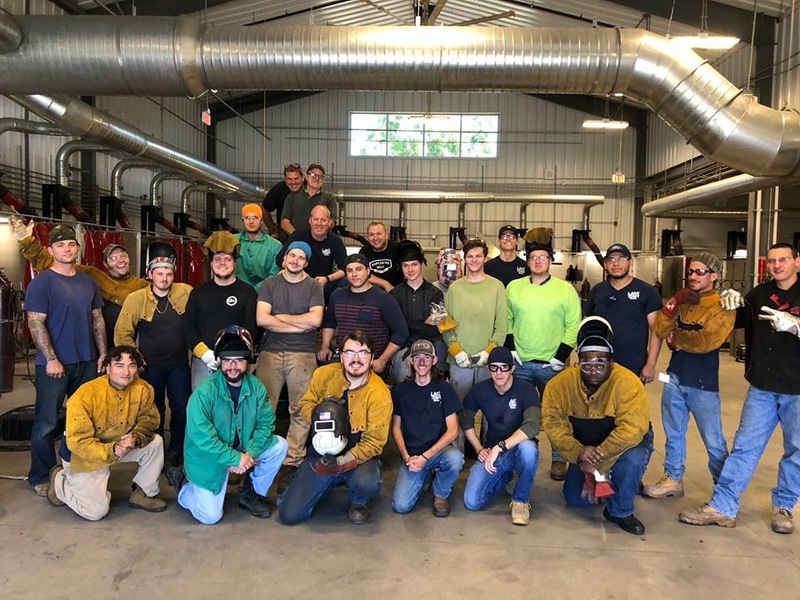 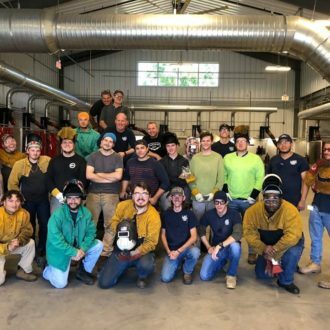 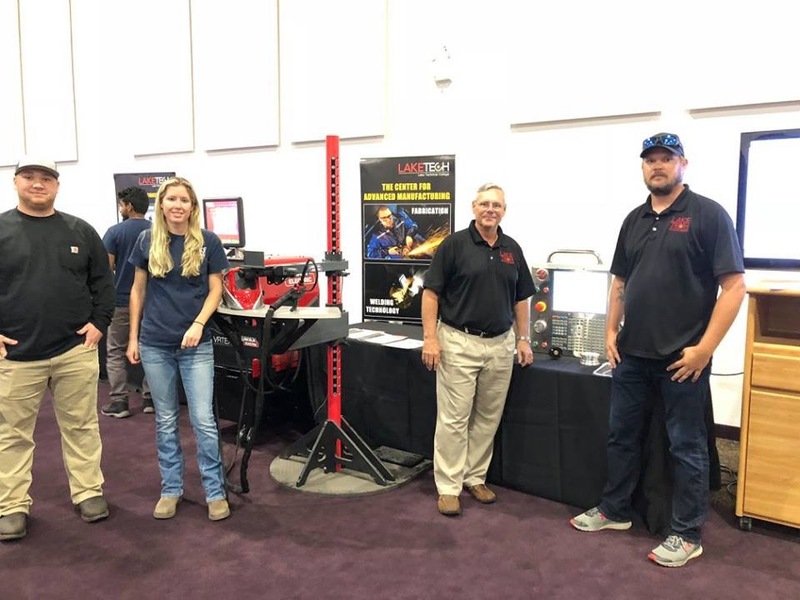 Lake Tech is proud of the students who have chosen welding as a career. 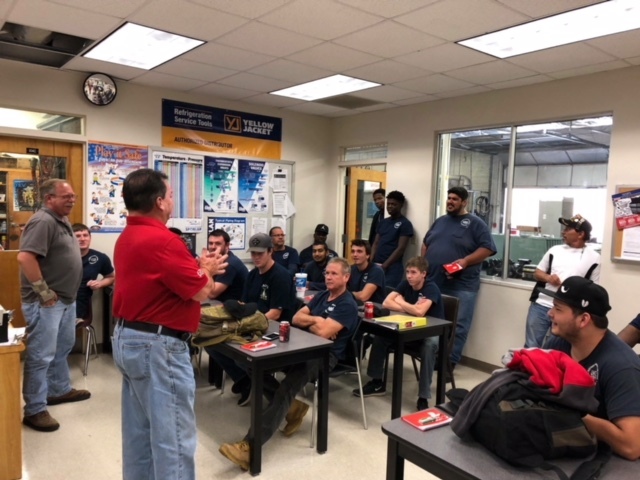 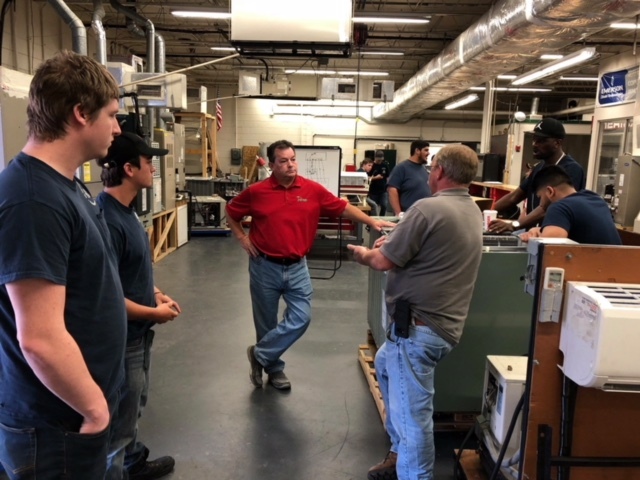 The Welding students met with the training director from the Local 803 to learn about employment options after graduation. 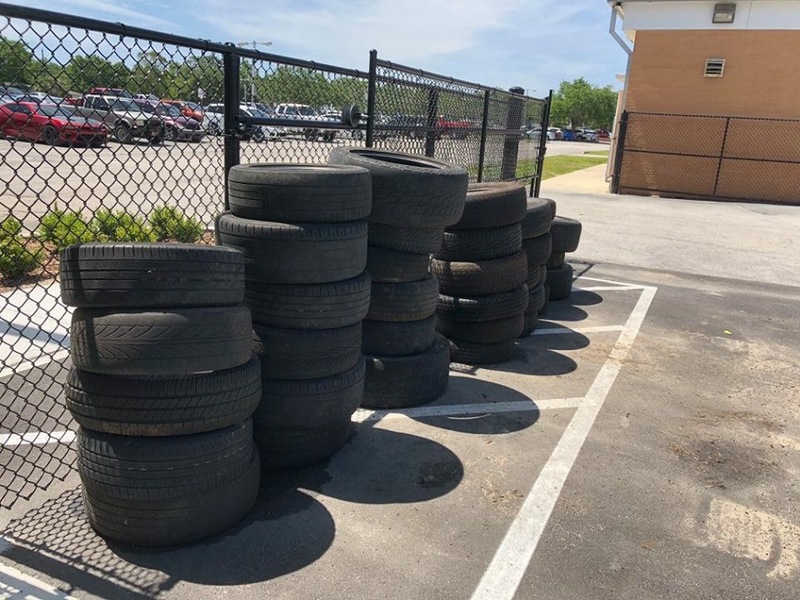 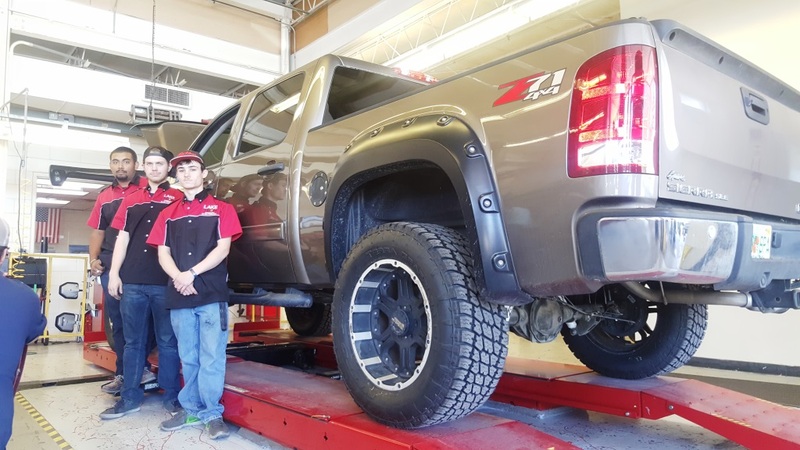 Automotive Service Technology – This week, students were involved in a quick project. 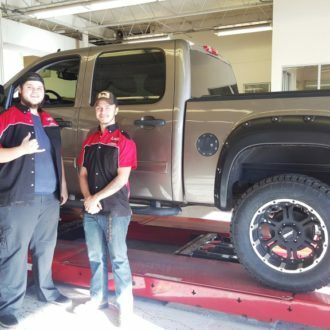 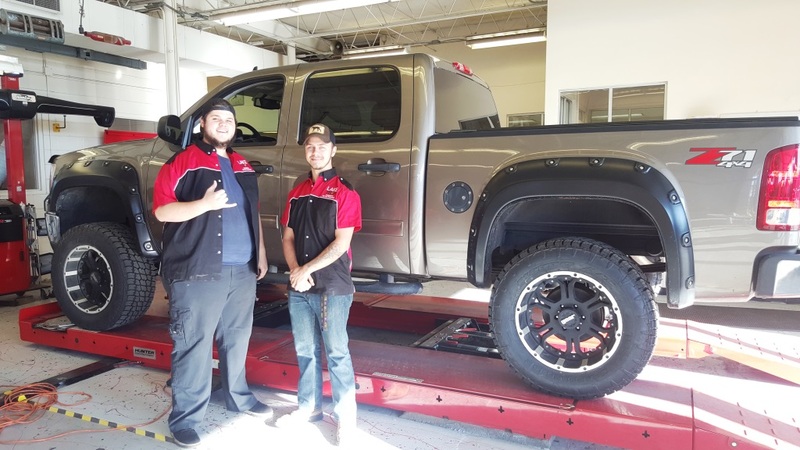 They installed a six-inch lift on the truck seen below. 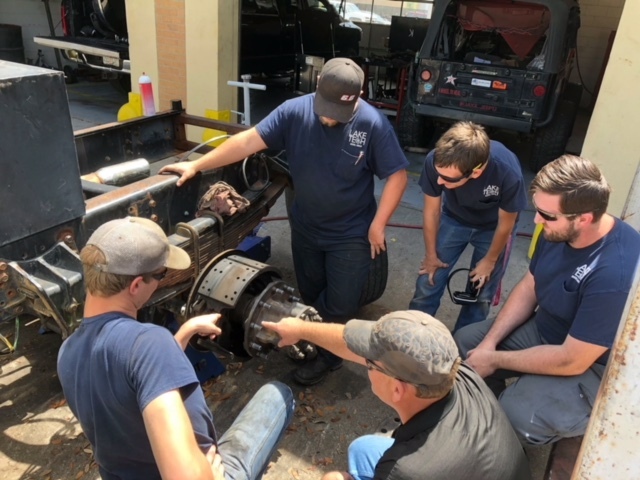 They learned how lifting a vehicle affects suspension angles and what is involved in order to have a quality ride after getting done with it. 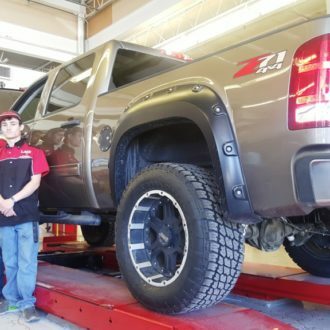 Plus, students love quick projects like that where they get to change the look of a vehicle. 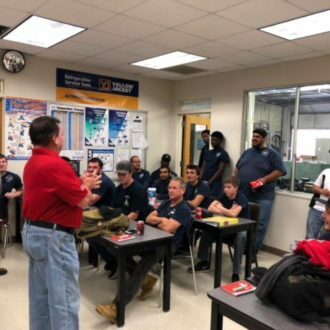 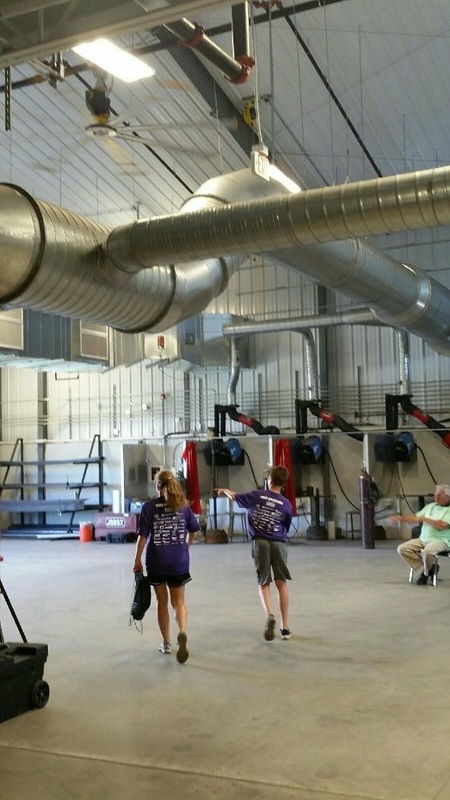 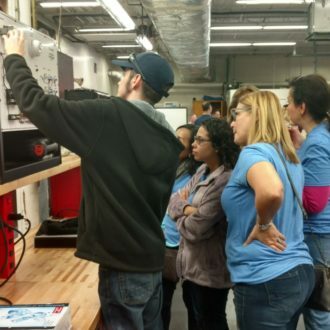 Diesel Technology – It was a very busy week for the Diesel students. 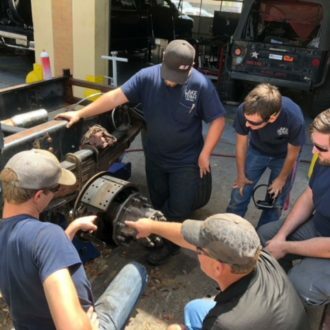 Some of the students started off the week by removing and rebuilding steering components and hub assemblies. 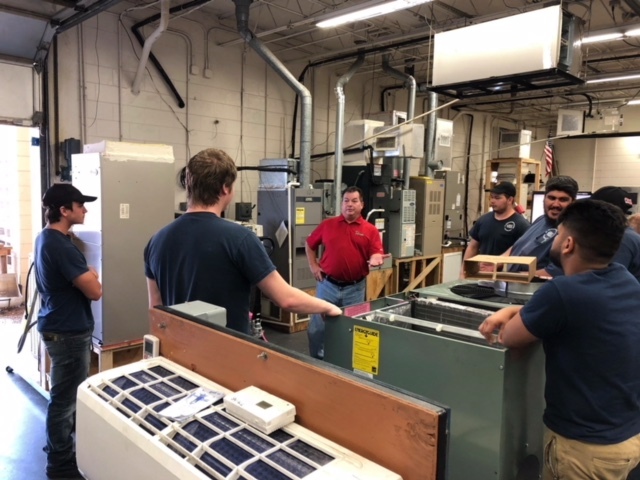 While others worked on A/C systems and A/C compressors using our training boards. 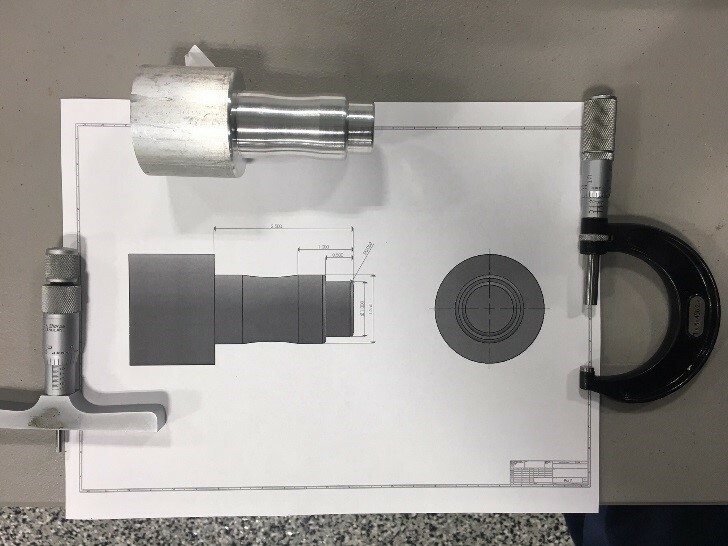 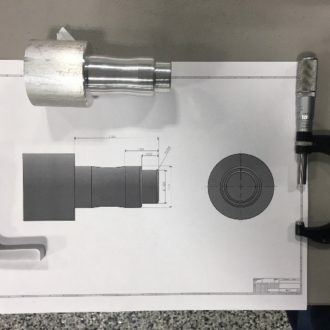 We also had students disassembling a single reduction axle drive unit checking to make sure the backlash and gear tooth contact pattern met specification. 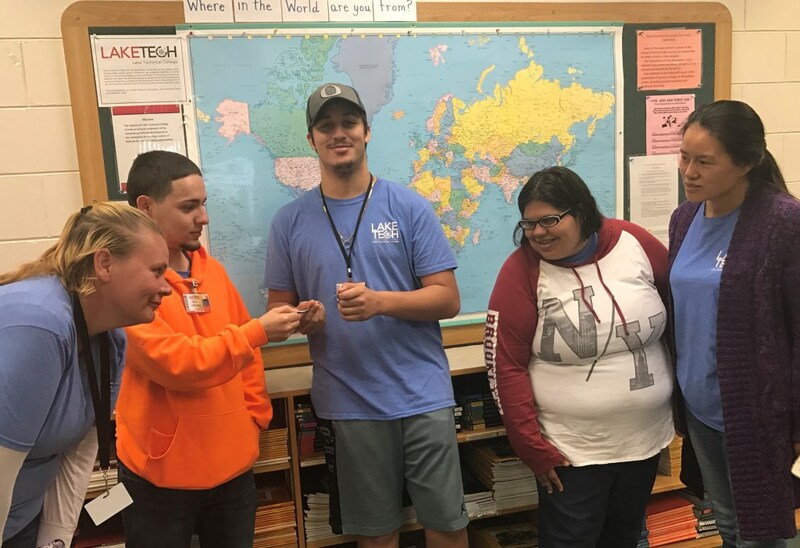 GED – ABE reading, students have been hard at work finding evidence and distinguishing between fact, opinion, credible, and accurate data. 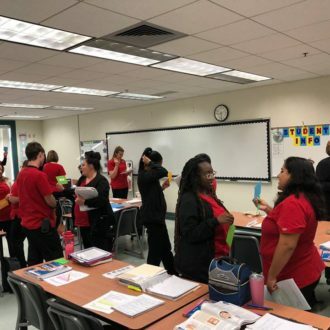 Writing prompts have varied in topic and length, and now students are ready to write an argumentative response. 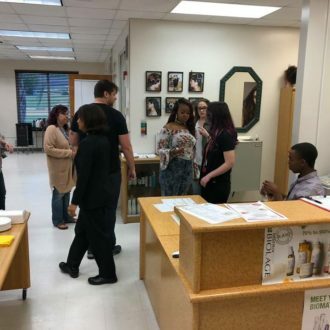 Ms. Bryant came by and interacted with students, encouraging students to defend their evidence. 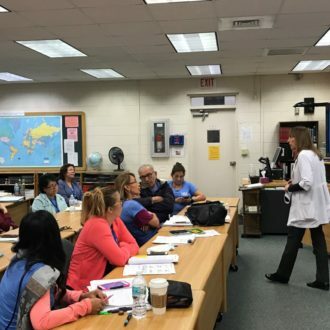 In a unit on bacteria and viruses, we examined the common cold, flu, and pneumonia. 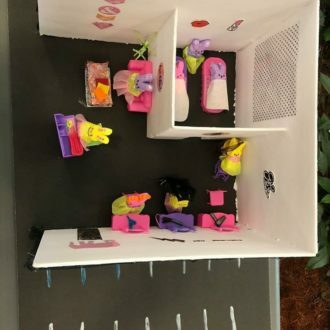 They are challenged with having to not only answer questions correctly, but to cite where in the passage they found their answers. 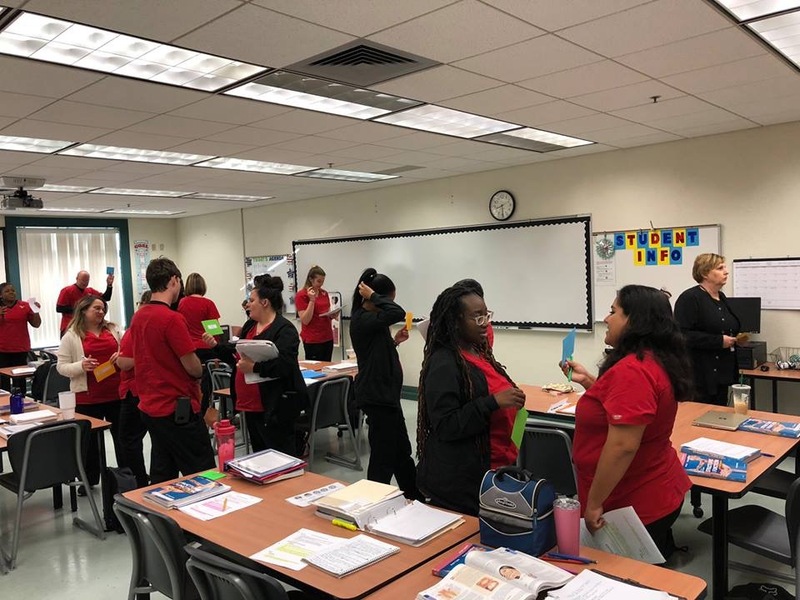 For inference related questions, students were asked to indicate which pieces of text were needed to create their answers. 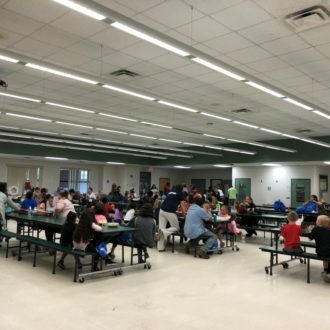 All of this requires students to have a good grasp of higher level critical thinking skills in addition to a strong reading basis. 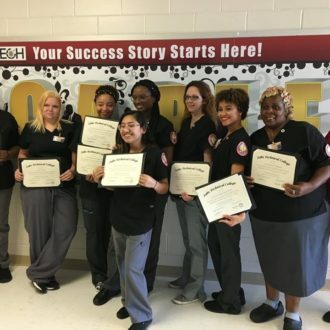 An HVAC/P3 GEDi student completed his social studies GED® test and is scheduling his 3rd one for next week! 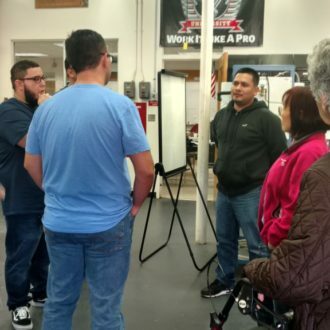 Another student is wrapping up review in math and will be taking his GEDReady™ and planning for his last GED® test. 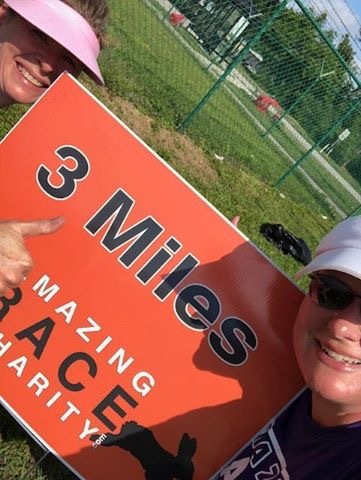 Go P3’s! 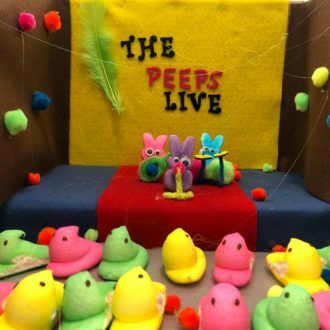 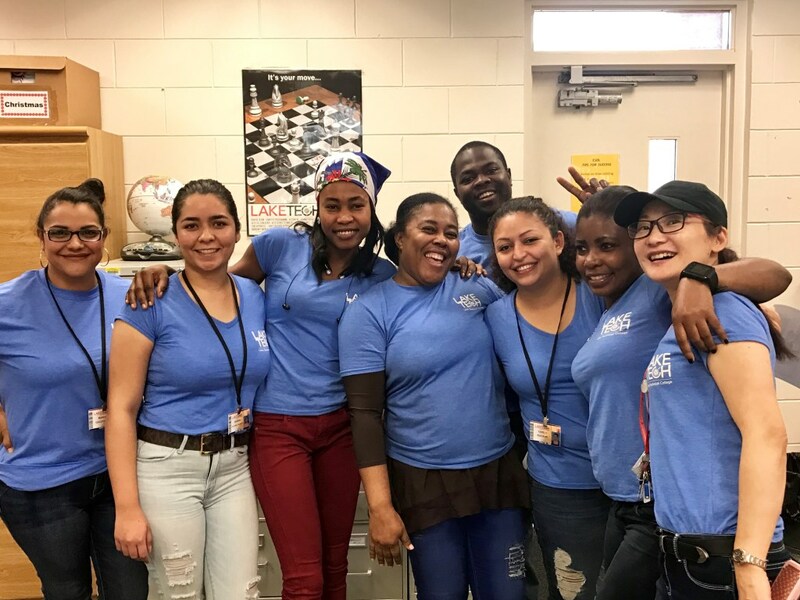 ESOL – It’s spring, and we’re not slowing down! 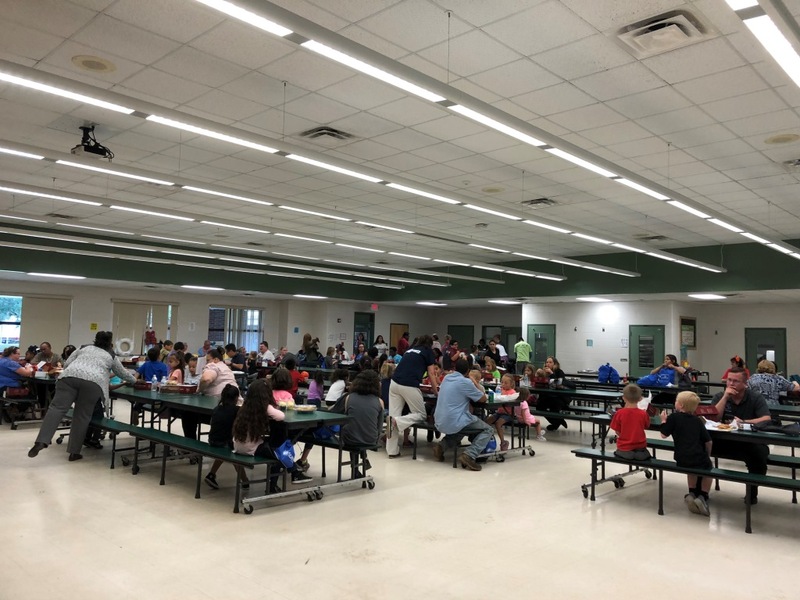 We’ve had a busy week, which has included some wonderful visitors. 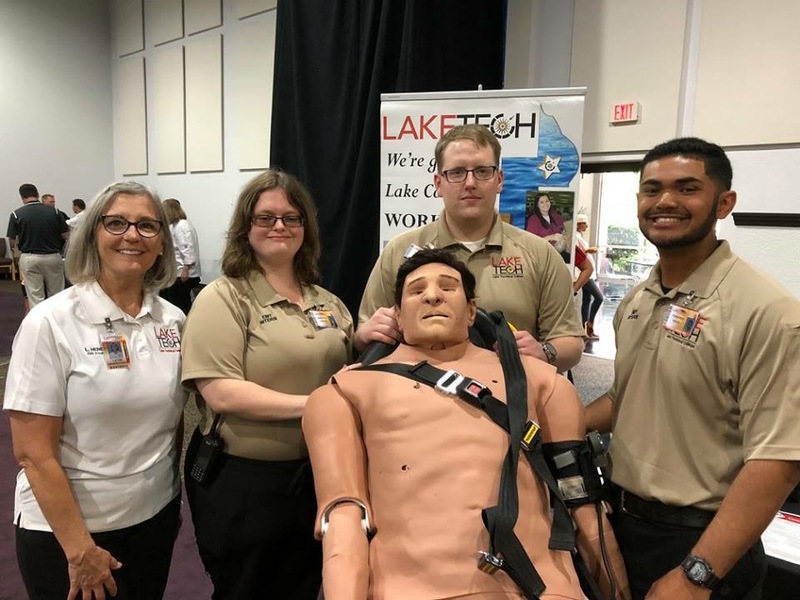 Kathy Perfumo from Lake Tech’s Health Science department came by to tell the students about all the wonderful options available for careers in the medical field. 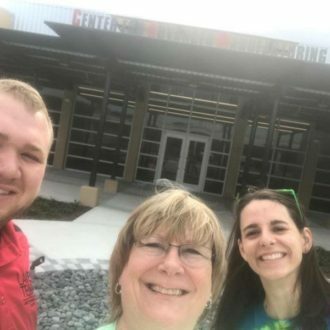 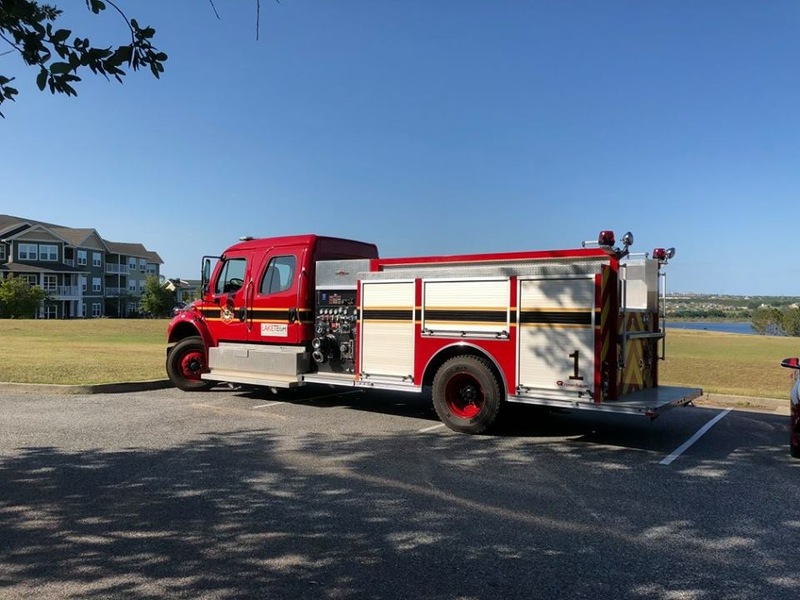 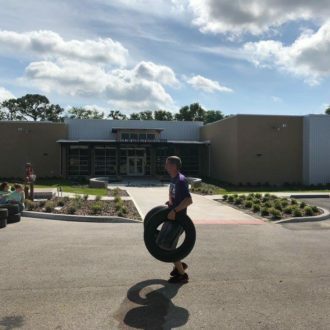 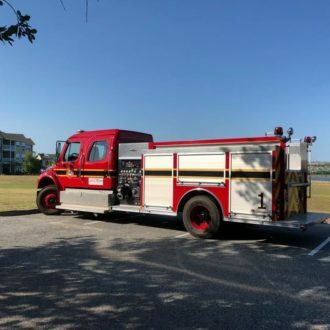 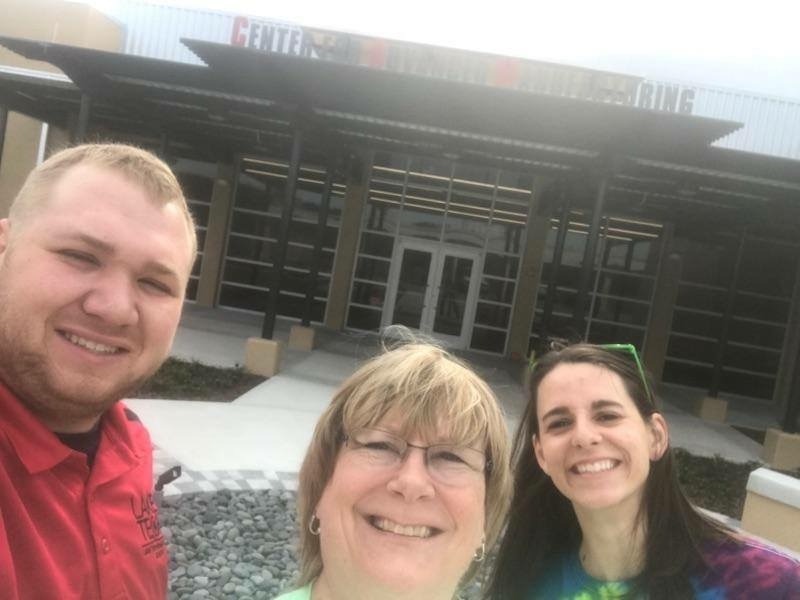 Cathy Lunday from the WT Bland Mount Dora Public Library visited to let us know about the numerous classes, programs, and events at the library that are FREE to anyone who has a library card. 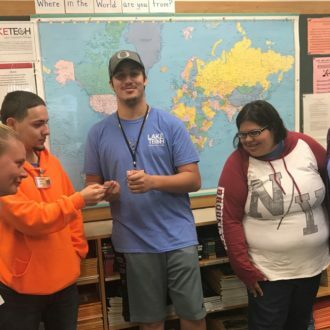 She even got each student started on the process of getting his/her own card, and we plan to follow up through on a field trip to the library next month. 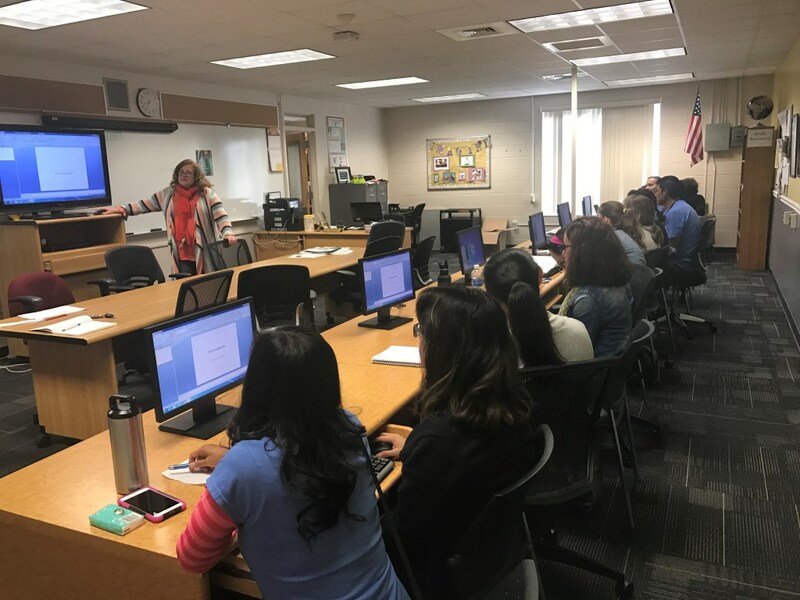 But for now, we didn’t venture far to get some excellent instruction on how to do a Power Point by our very own Career and Technology Specialist, Sonya Rosenglick. 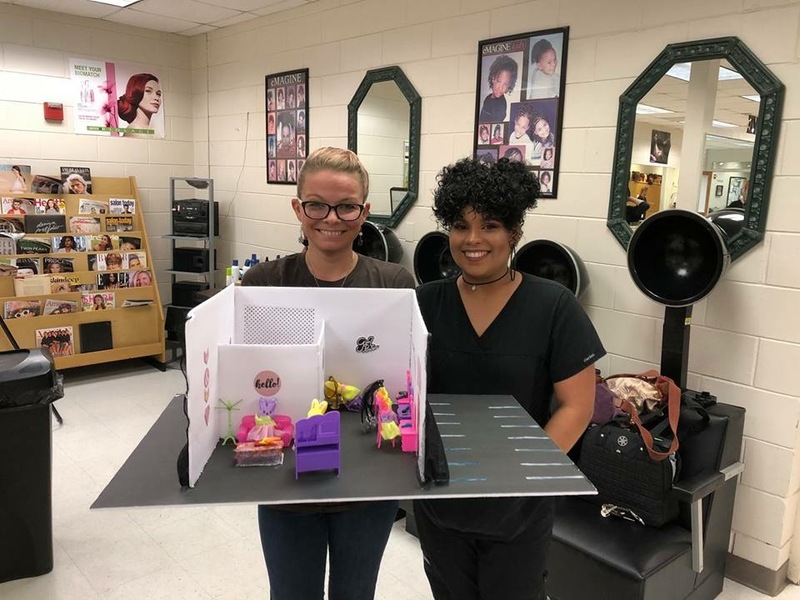 Our advanced students are already in the process of utilizing this skill for an assigned presentation. 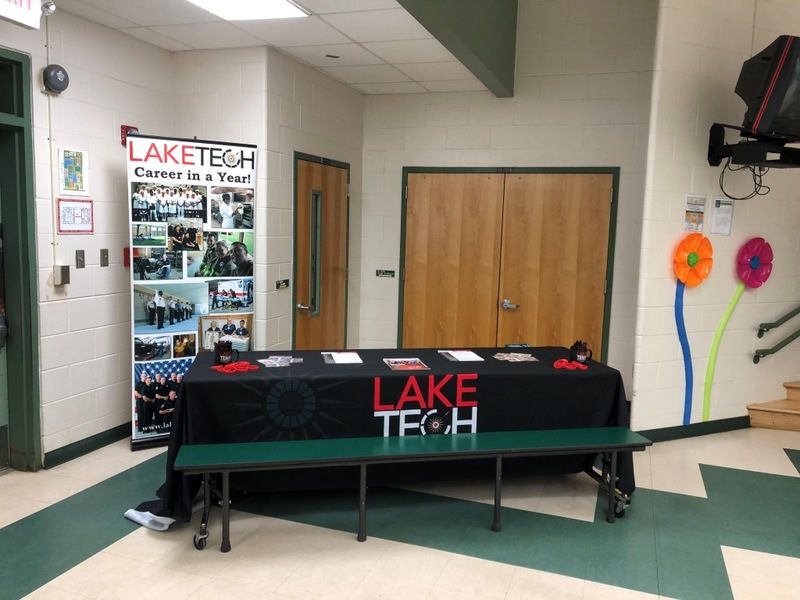 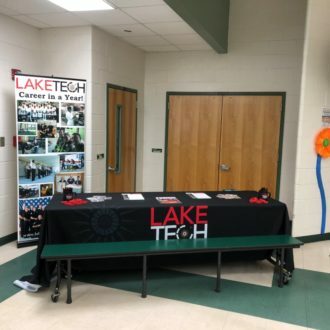 Interviews of staff throughout the school by our advanced students are already underway, and we have enjoyed learning about the friendly faces here at Lake Tech. 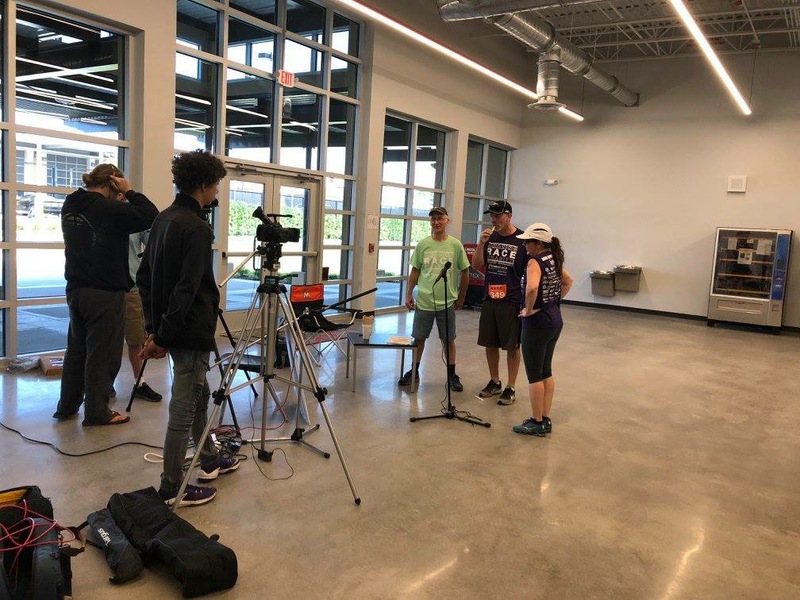 Our beginning students are already studying the past progressive verb tense, and even had the opportunity to write their own commercials for an assignment. 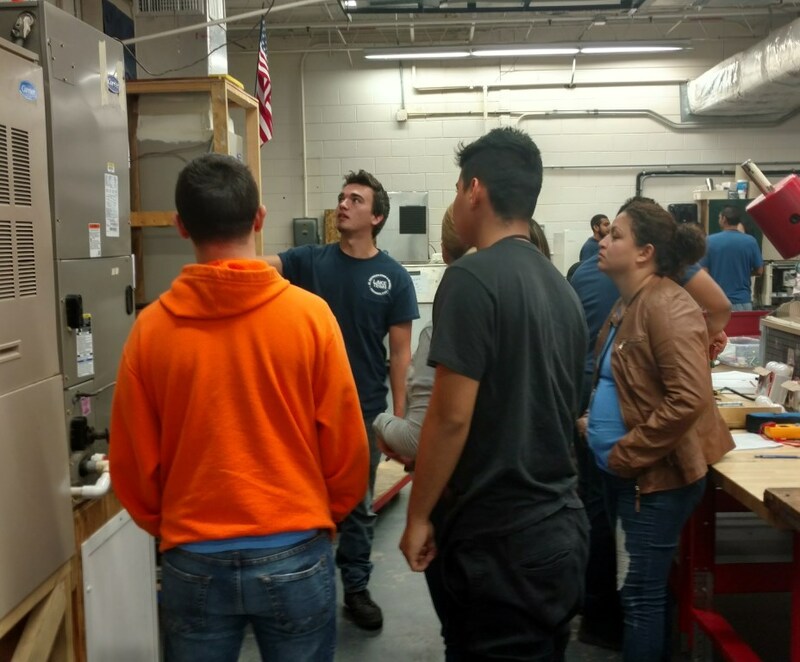 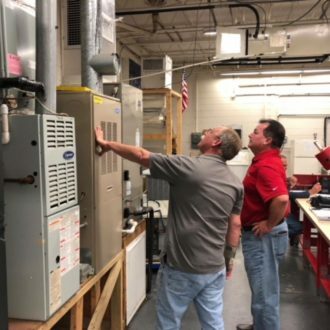 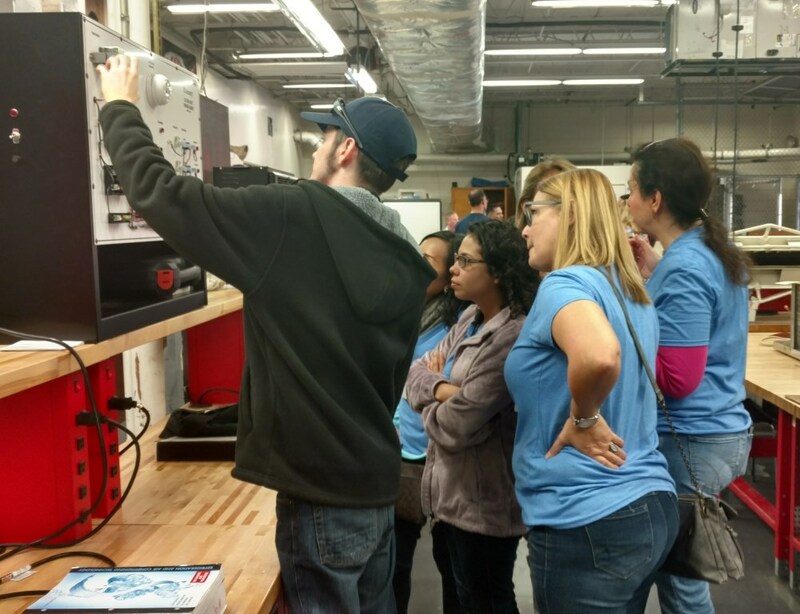 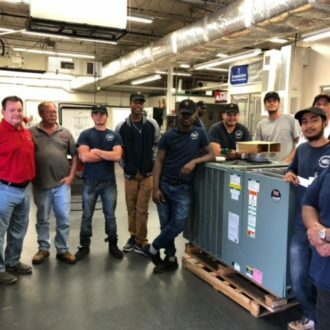 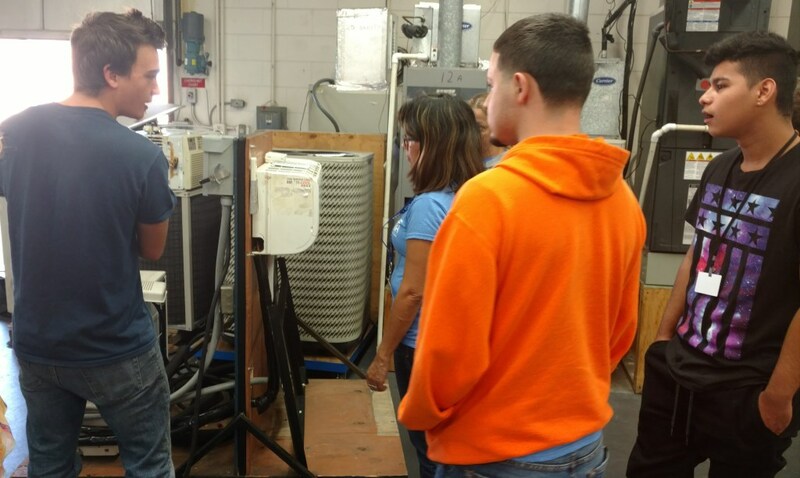 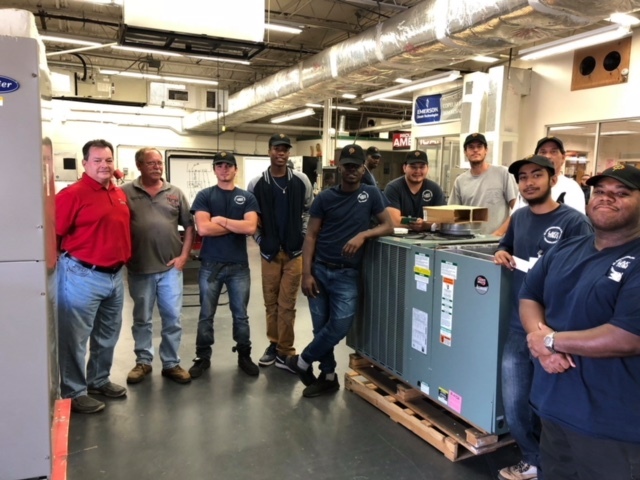 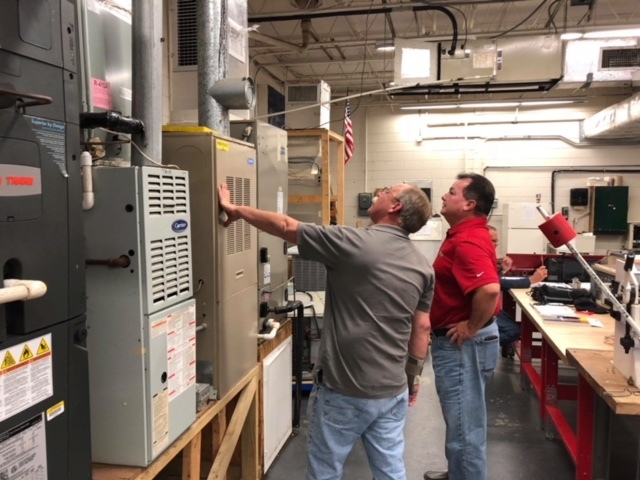 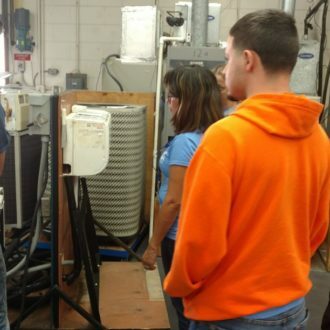 ESOL students visited the HVAC program as part of their work skill curriculum. 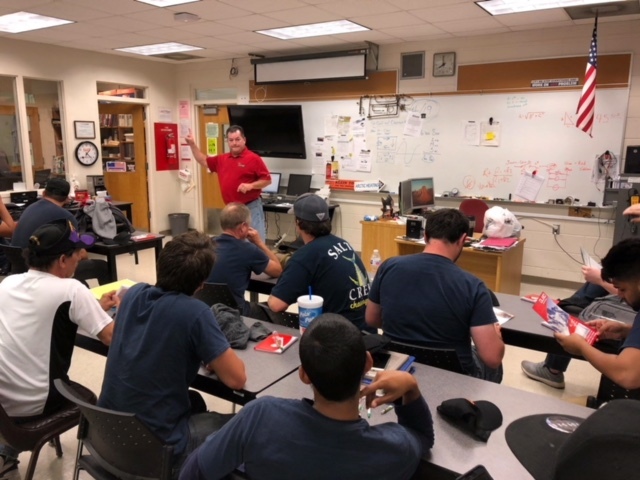 HVAC students were paired with ESOL students who asked questions about the program requirements. 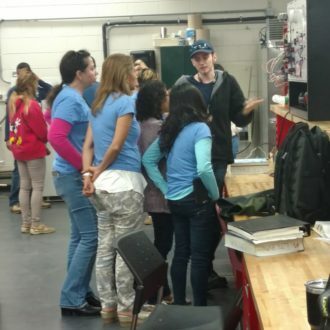 It was a great opportunity for all students to interact, get to see other students, and programs. 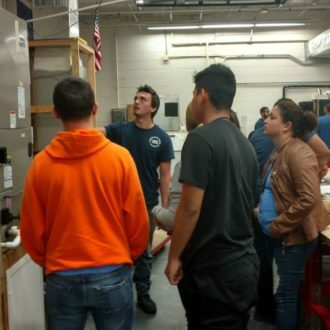 Work and career skills were demonstrated and enhanced through the collaborative question and answer session. 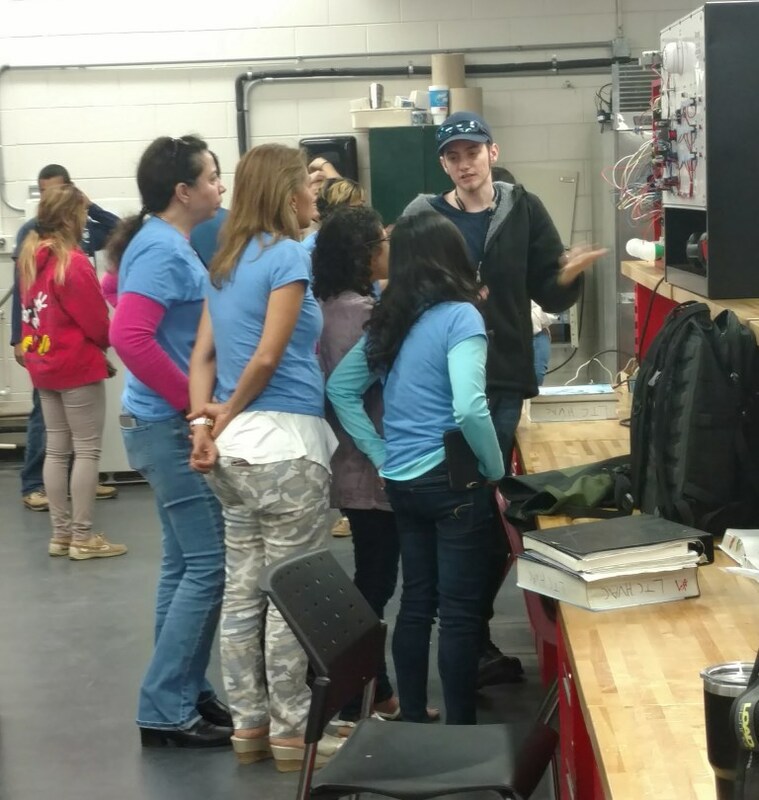 Thanks to Mr. Bagg and his class for welcoming and hosting the ESOL students’ visit. 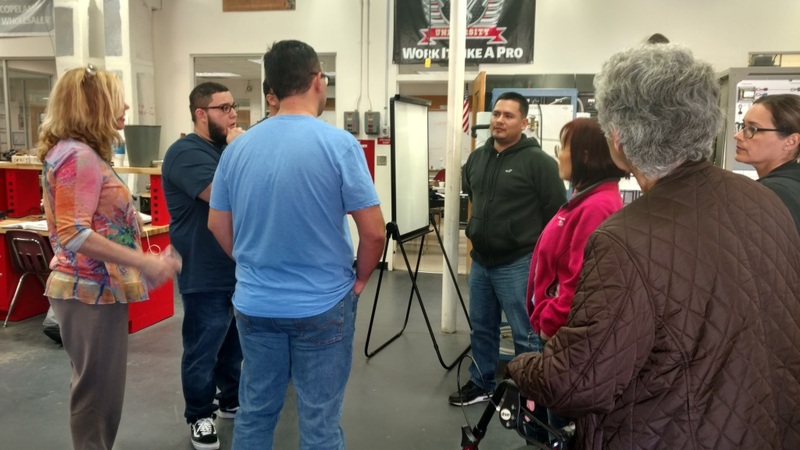 Afternoon Adult Basic Education – What readers we have! 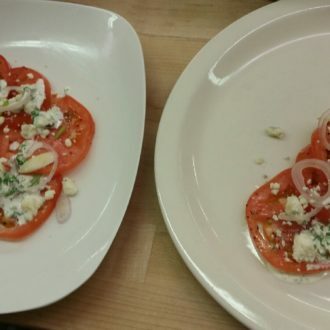 We ventured into the world of Uri Geller and his mind-bending (or spoon-bending) activities. 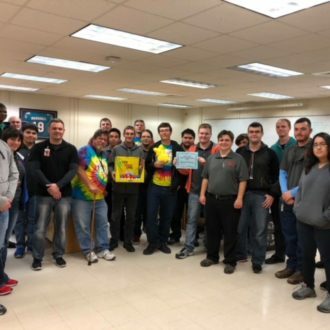 The students were convinced they could disprove his abilities (see photo). 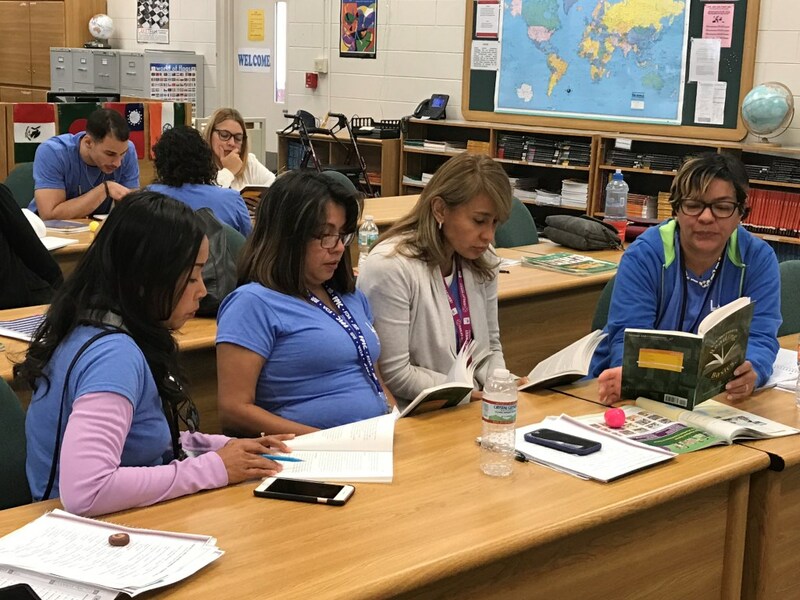 We incorporate reading into everything we do, and many of our student choose reading activities for practice and follow-up to our lessons. 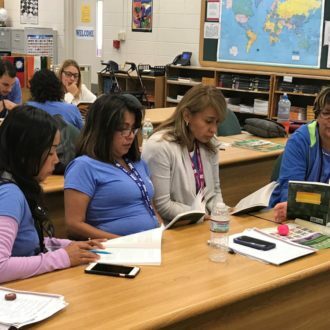 They even borrow books to take home! 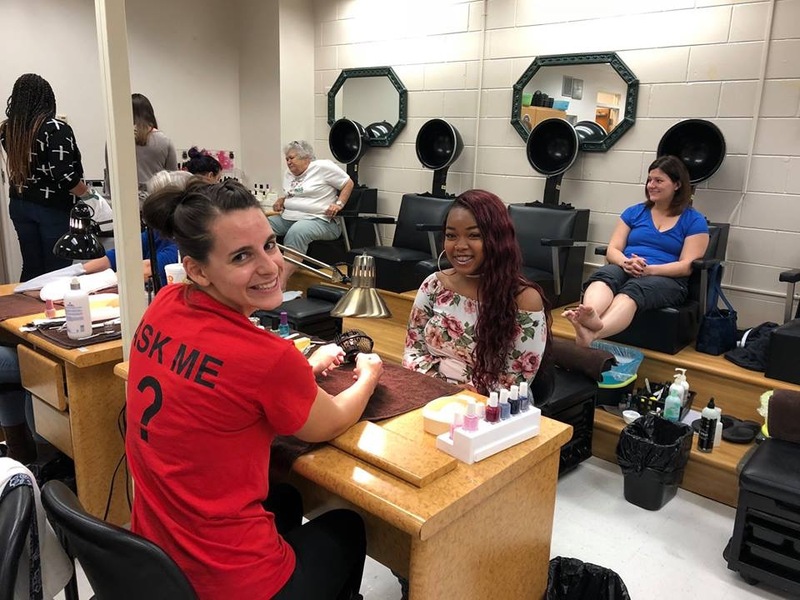 As for Reading, we’ve been working on recognizing stated and non-stated concepts. 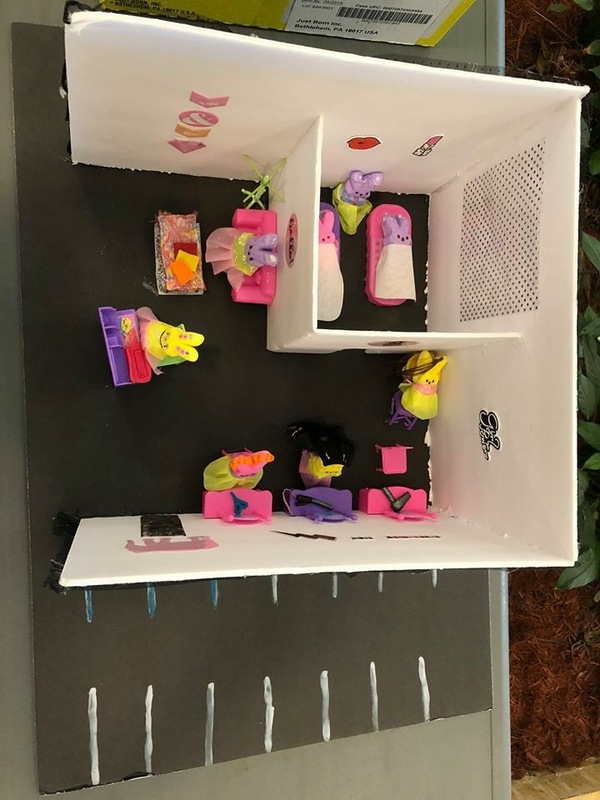 In Language, we’ve practiced identifying topic sentences, and related details and descriptions. 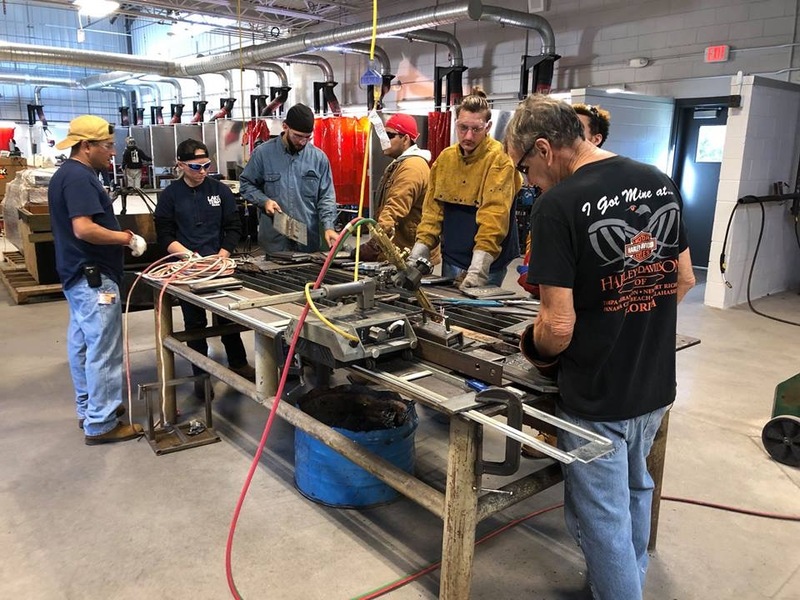 Our students are learning much and working hard. 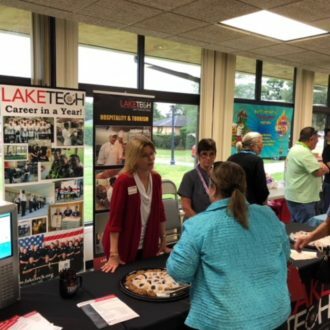 March 28 was the 5th annual Partners for Success sponsored by Lake County Economic Development. 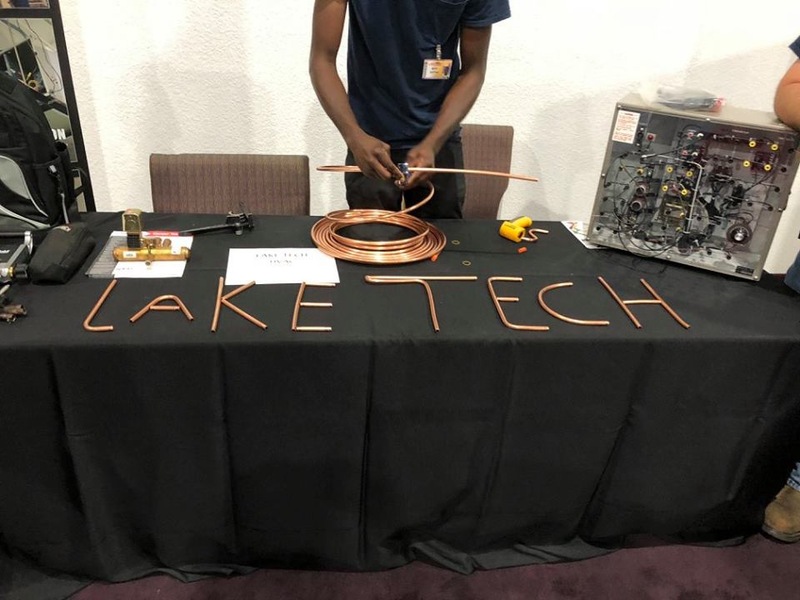 As always, Lake Tech set up a great display. 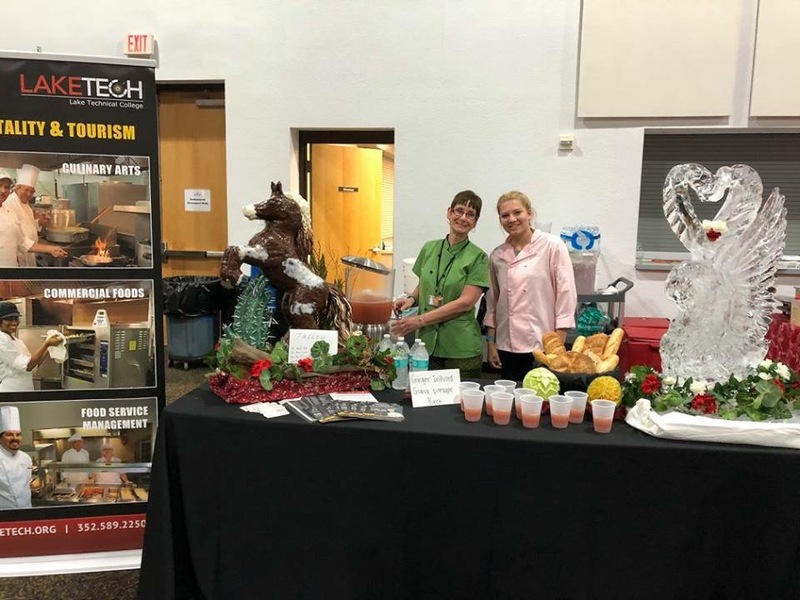 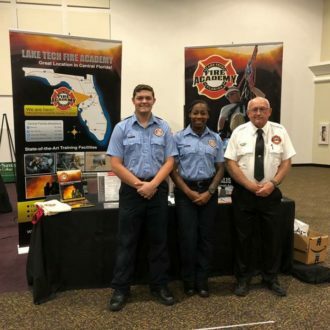 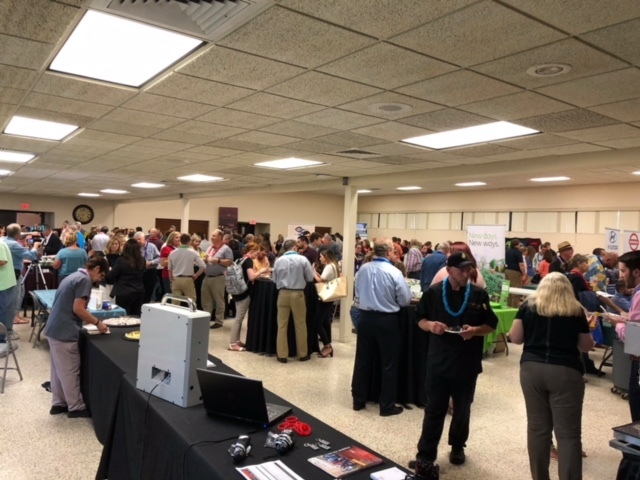 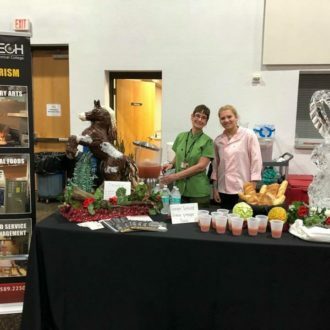 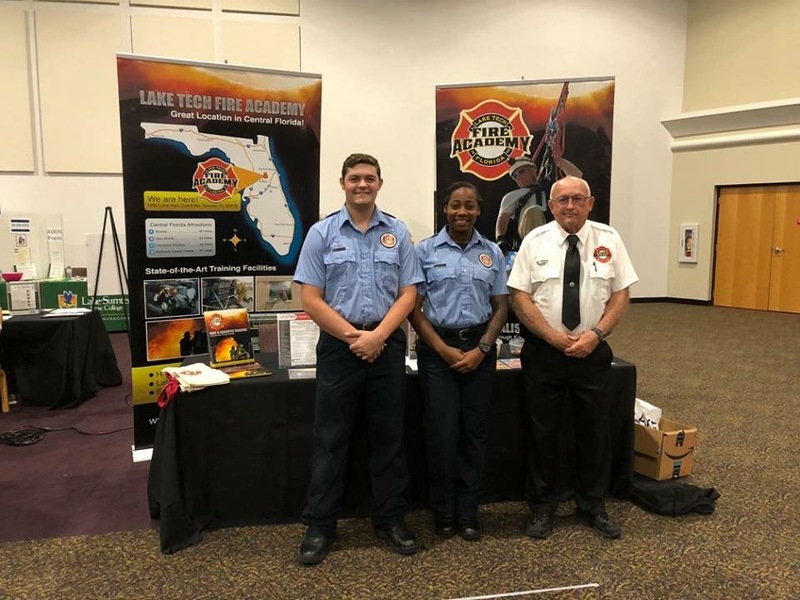 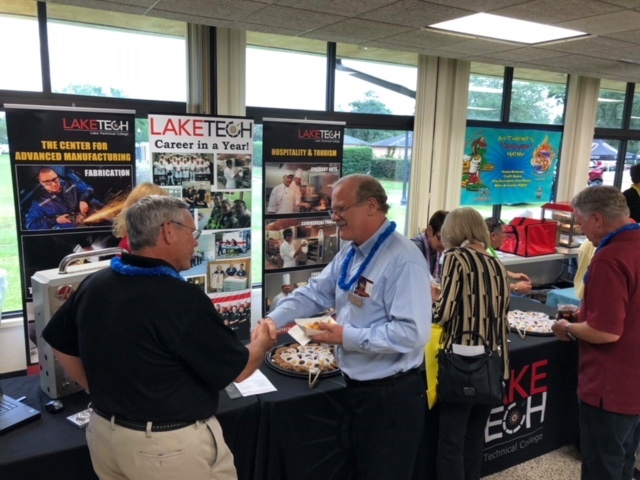 Morgan Black represented Lake Tech at the Taste of Lake and Business Expo 2018 held in Leesburg. 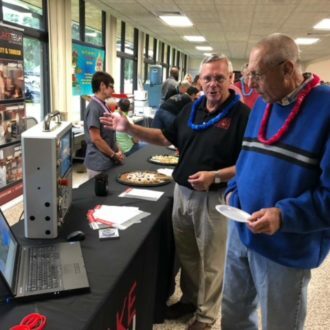 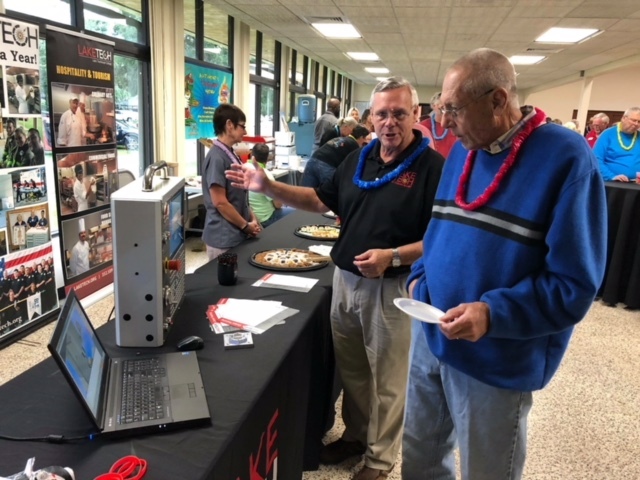 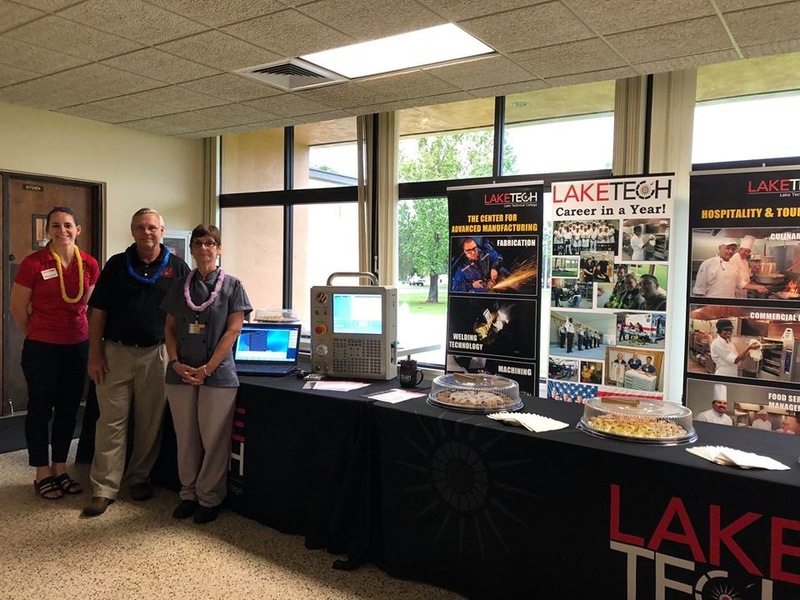 Paula Lach, from the Culinary program, prepared food and instructor Chris McMahon displayed information about the CNC program at Lake Tech. 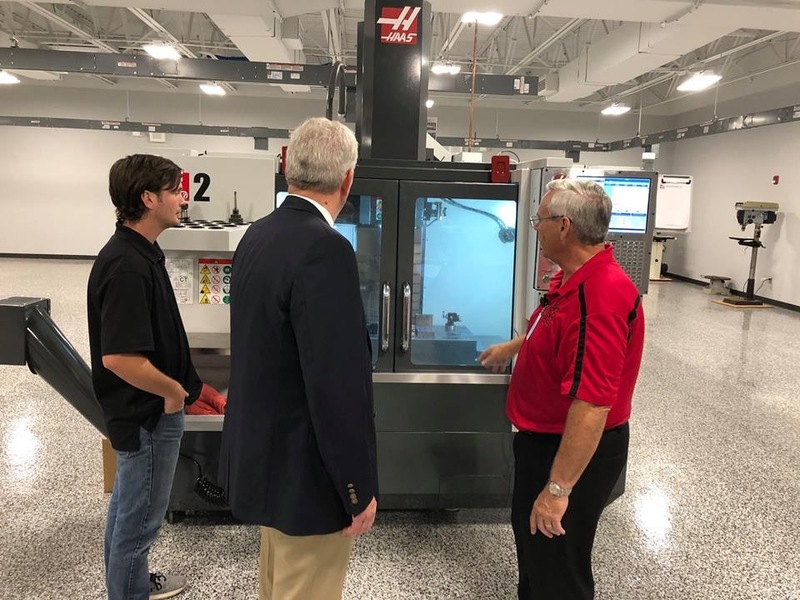 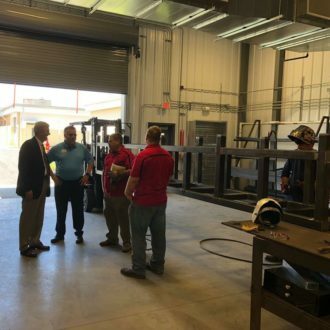 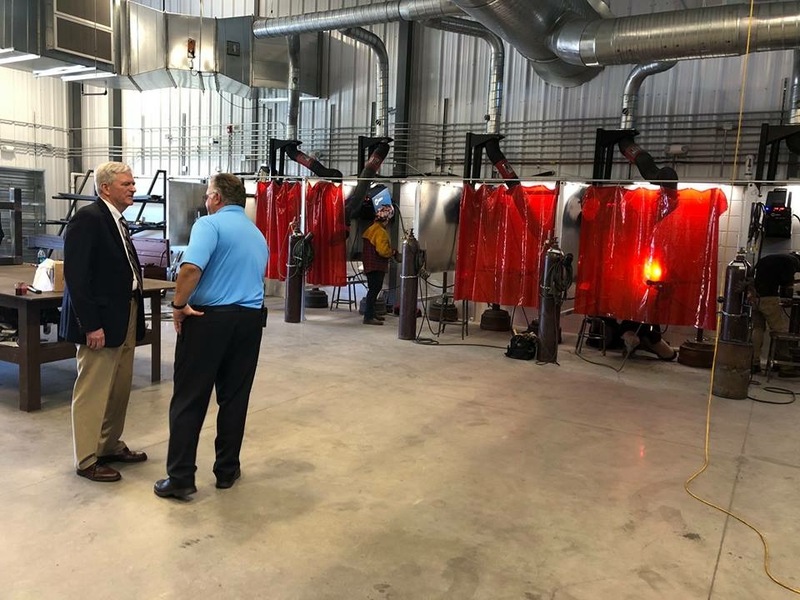 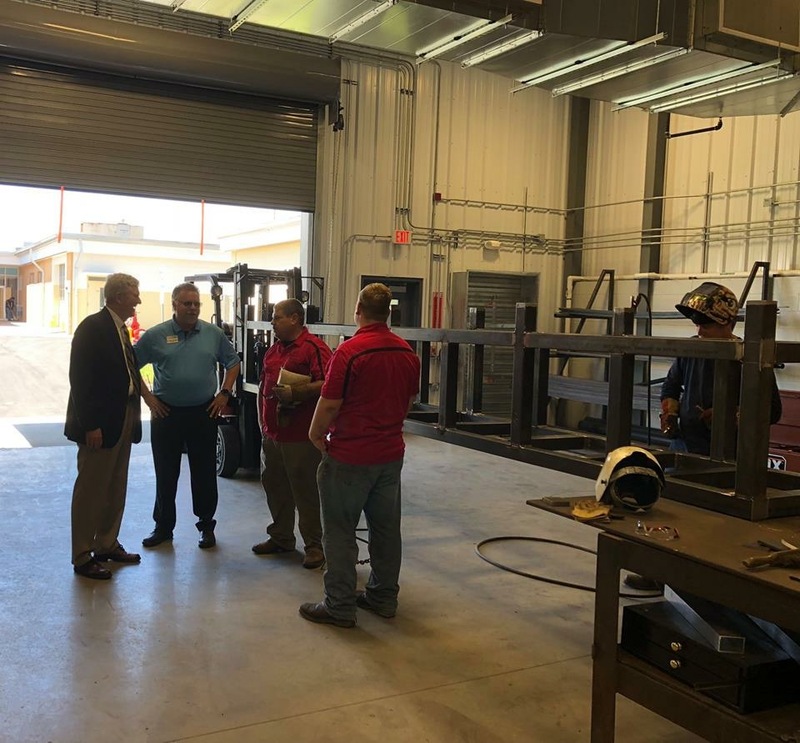 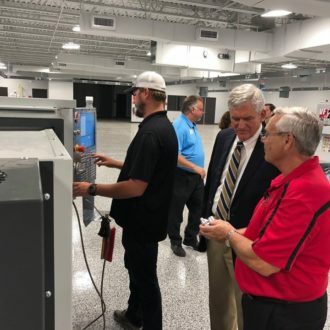 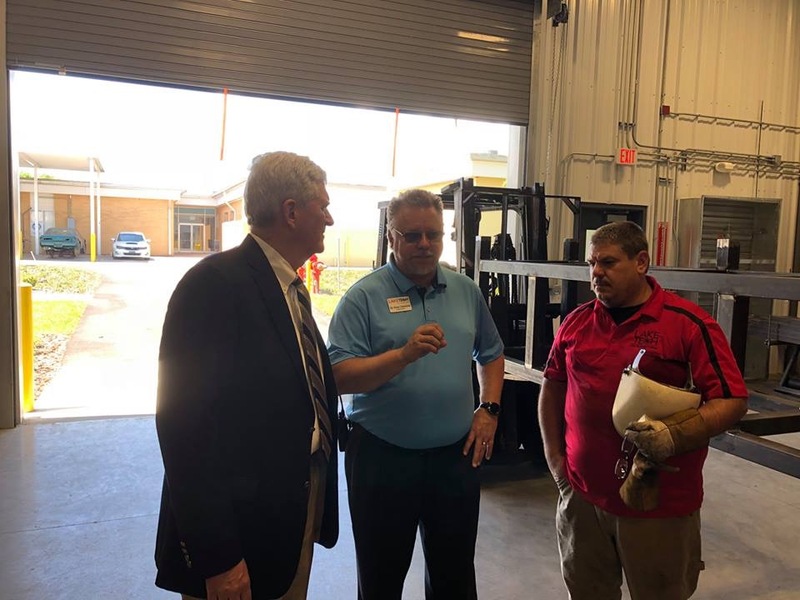 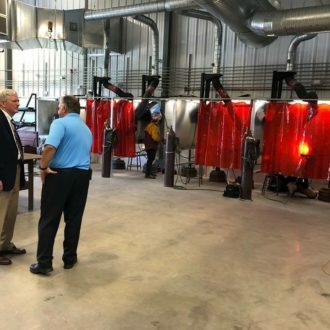 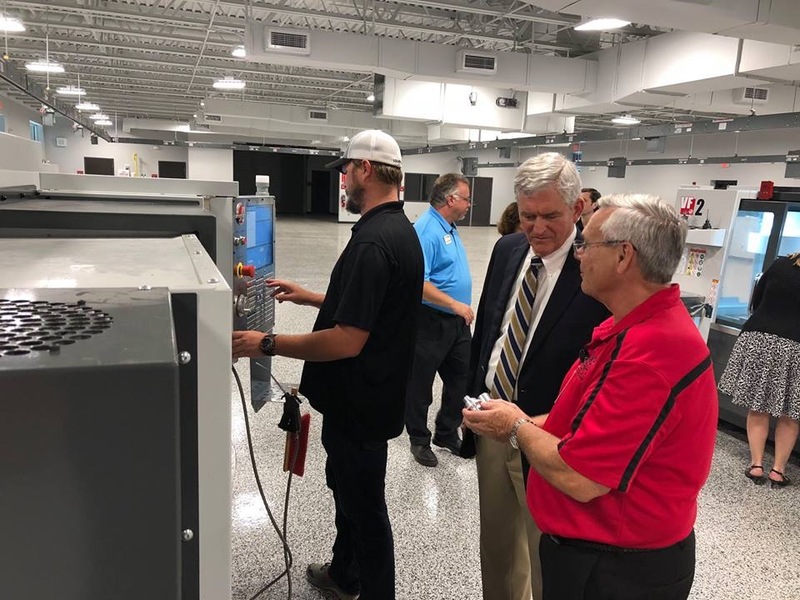 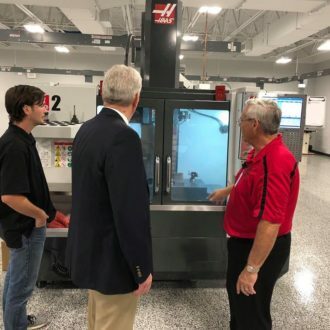 On April 3, US Congressman Dan Webster and his staff toured the Center for Advanced Manufacturing. 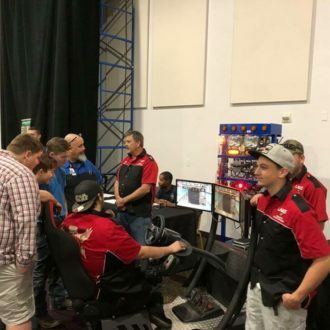 He has been a supporter of the project since the beginning. 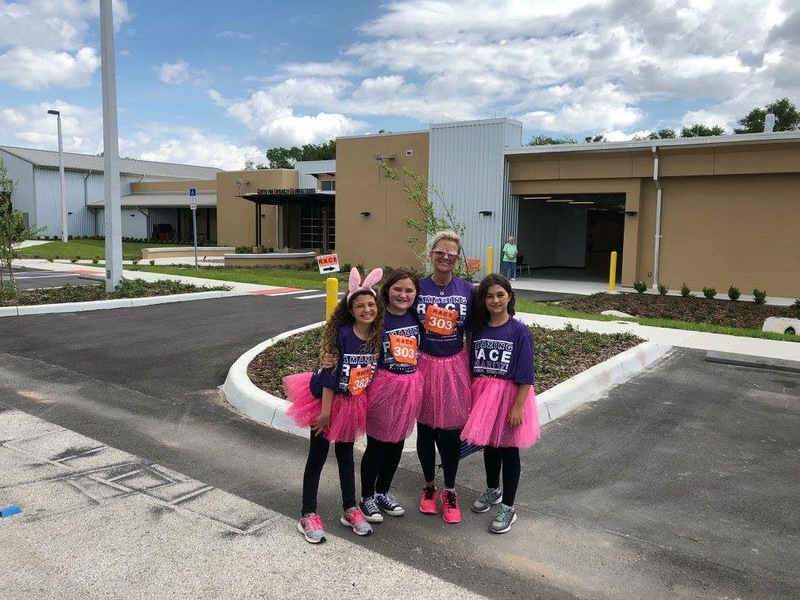 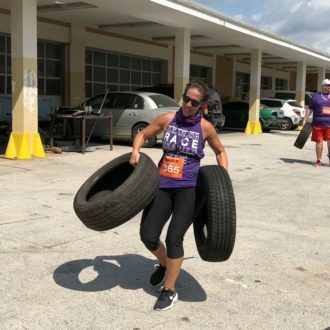 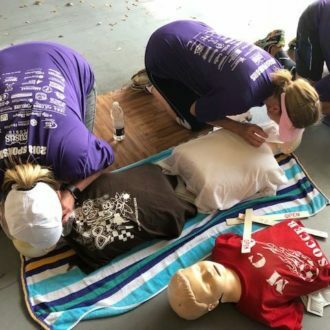 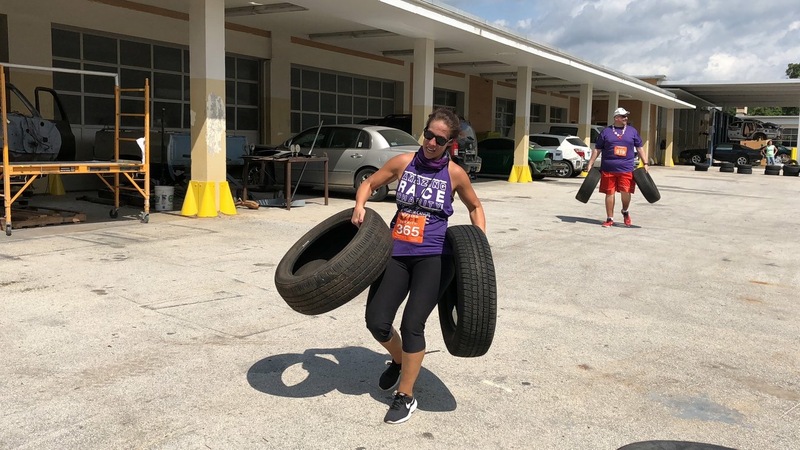 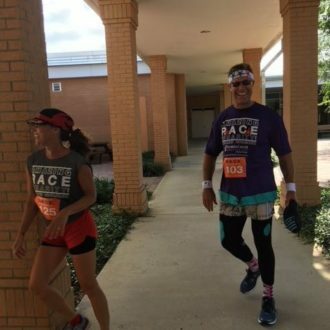 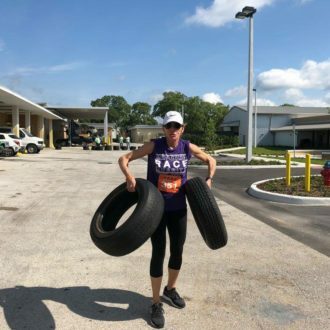 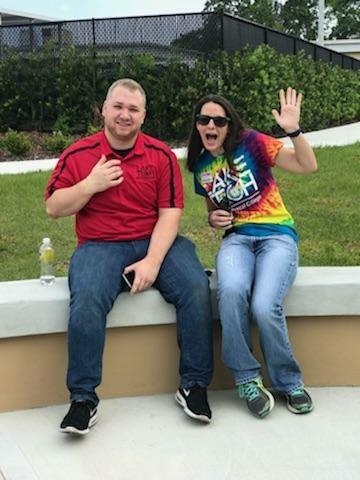 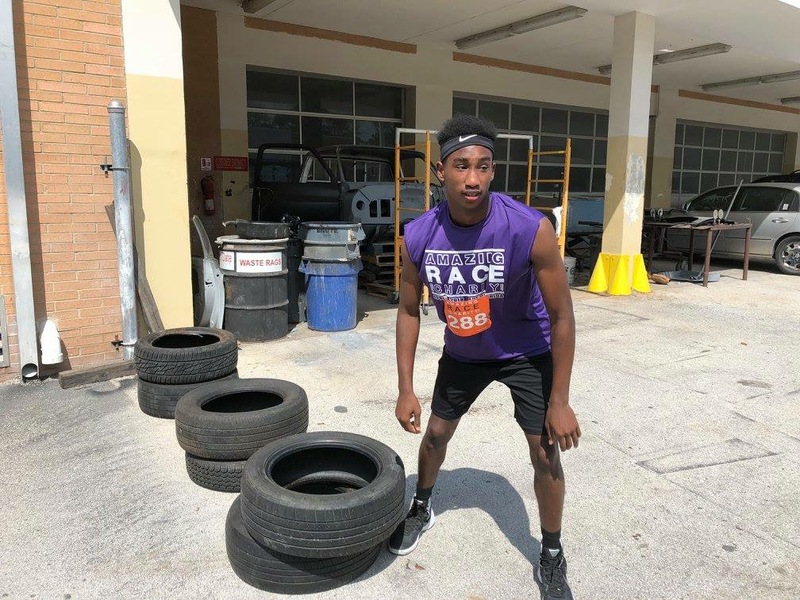 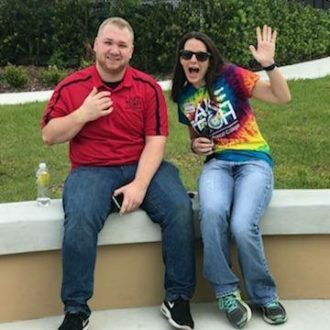 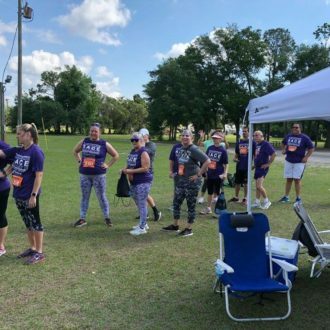 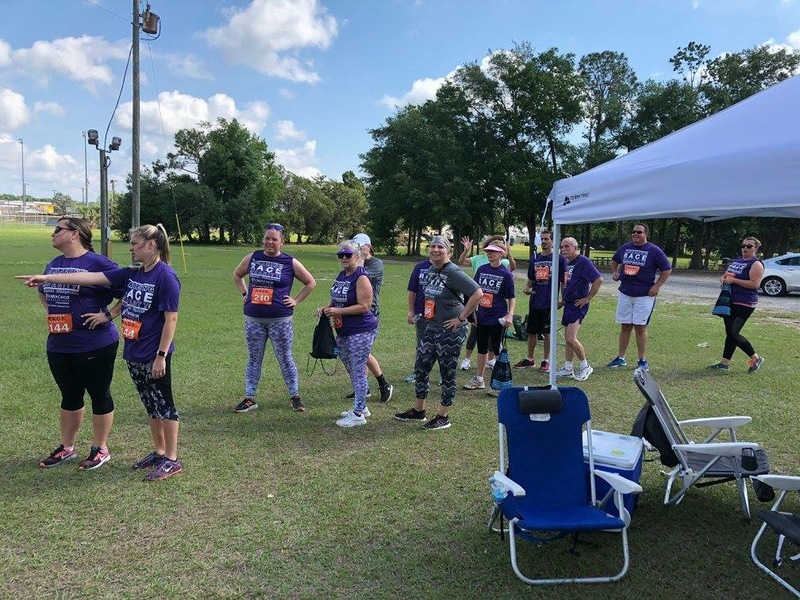 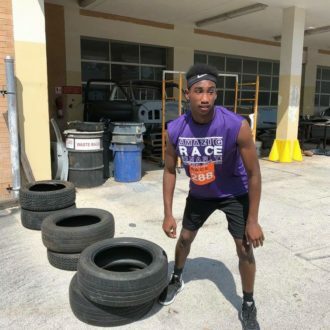 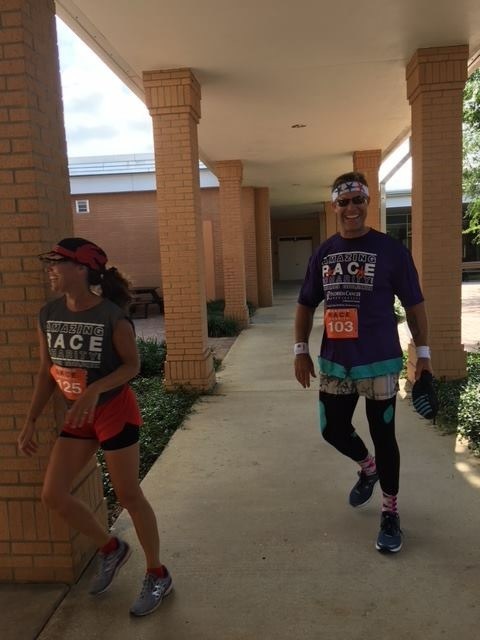 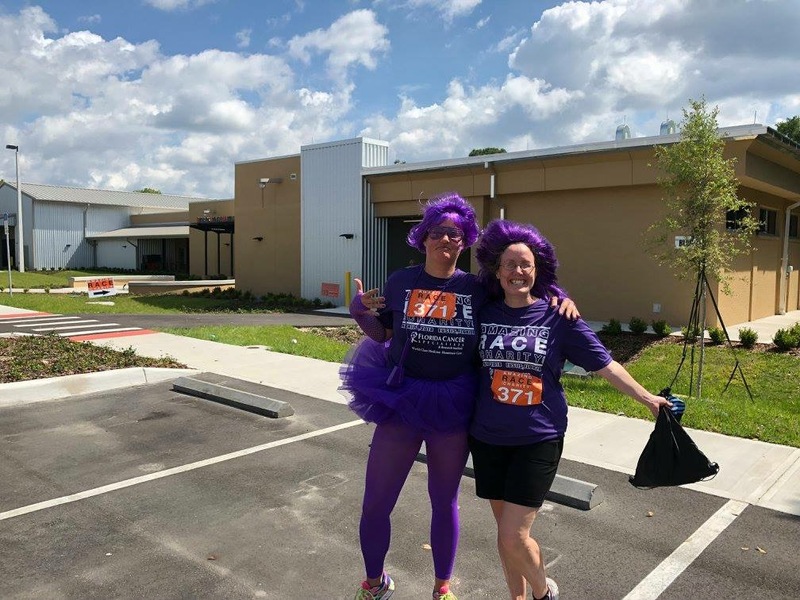 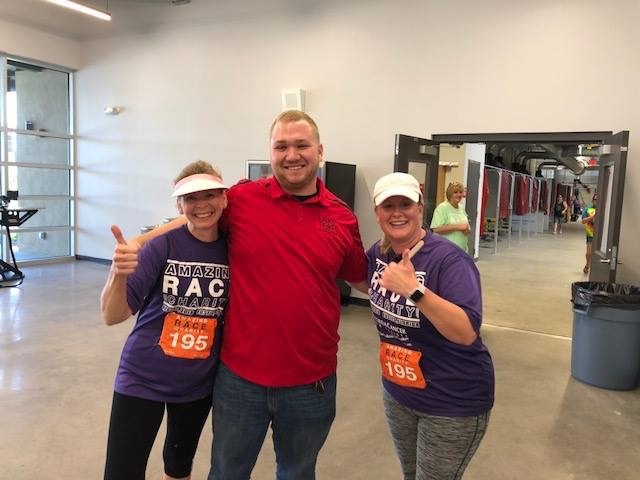 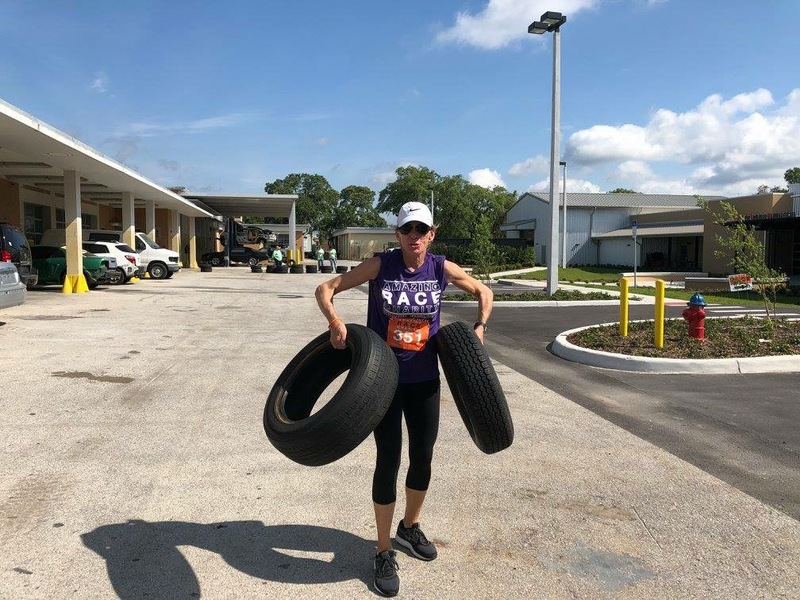 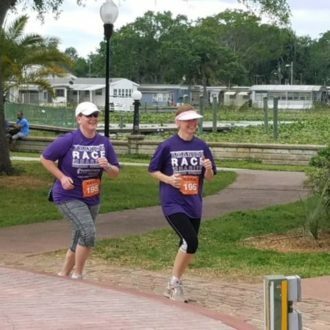 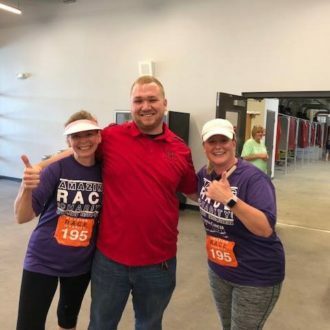 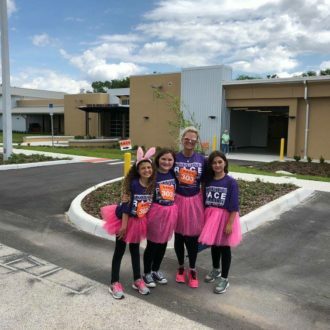 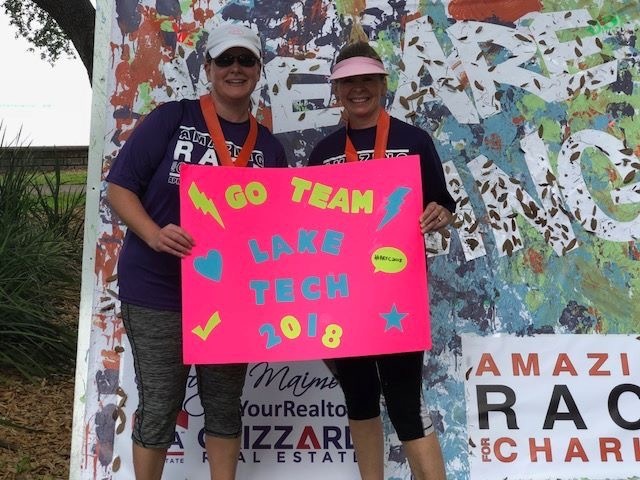 Lake Tech participated in the Amazing Race for Charity again this year in two different ways. 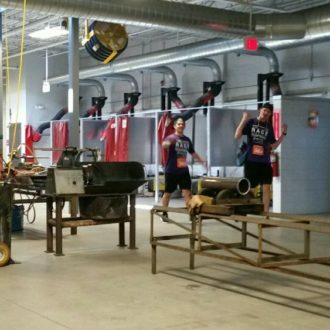 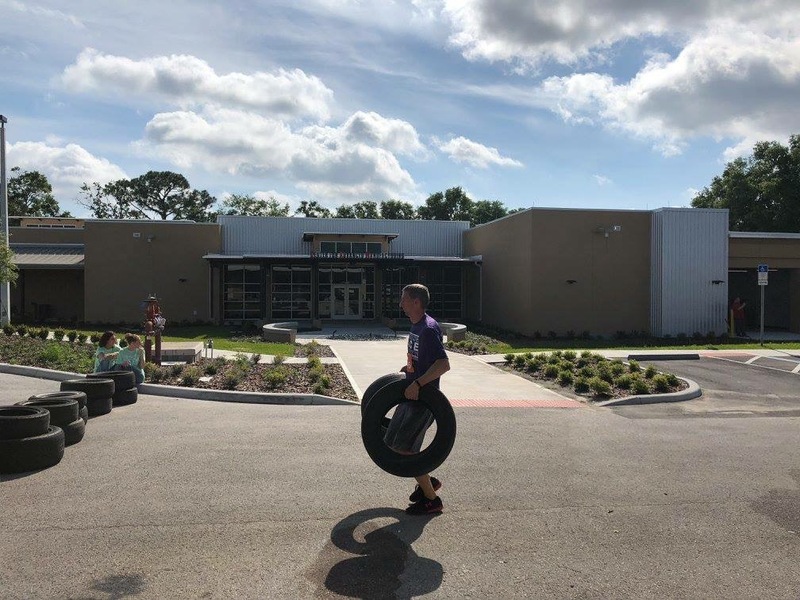 First, The Center for Advanced Manufacturing was one of the obstacle stops for the 600 racers. 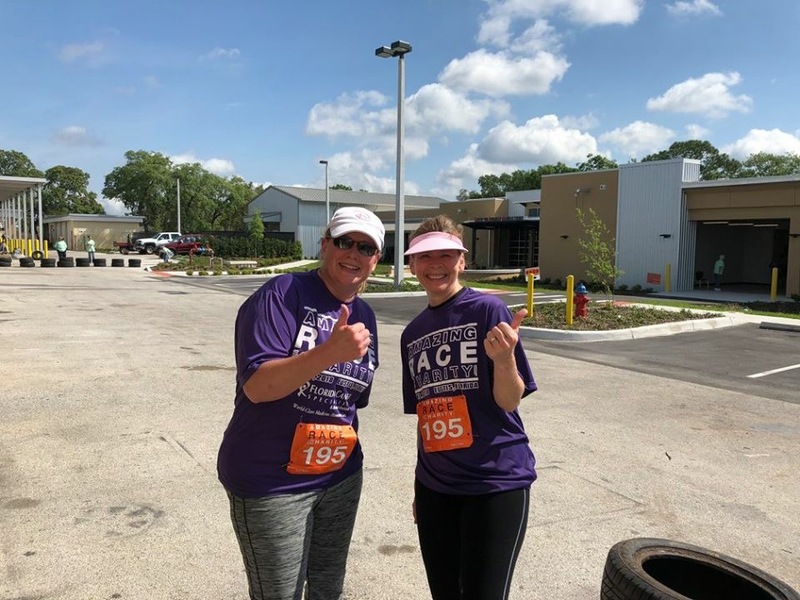 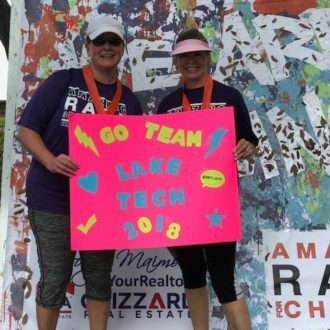 Second, Team Lake Tech, made up of Melissa Stephan and DeAnna Thomas, participated as runners in the race. 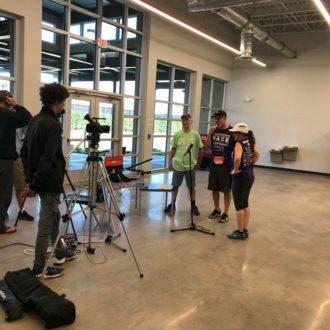 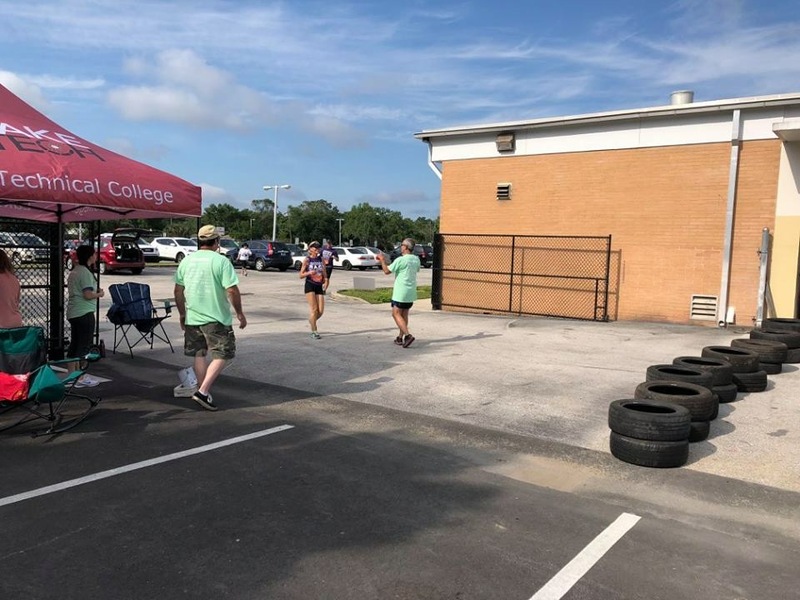 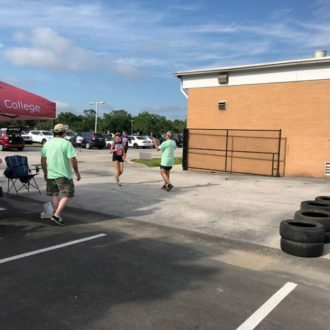 Morgan Black coordinated the Lake Tech portion of the race and set up a table at the Expo and Race Packet Pickup held at the YMCA. 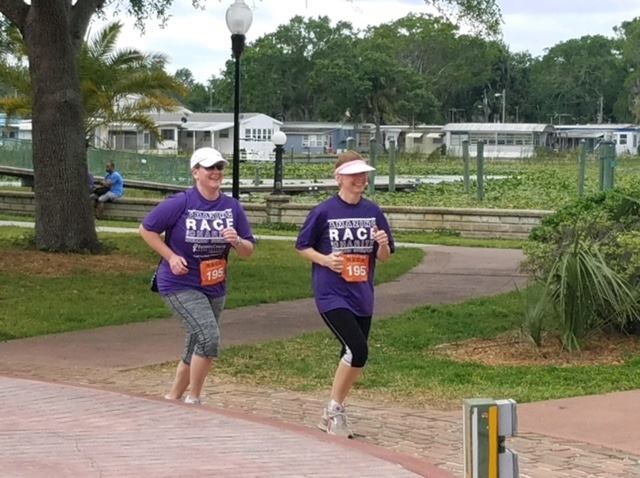 See if you can spot one of the Lake Tech Board members running the race! 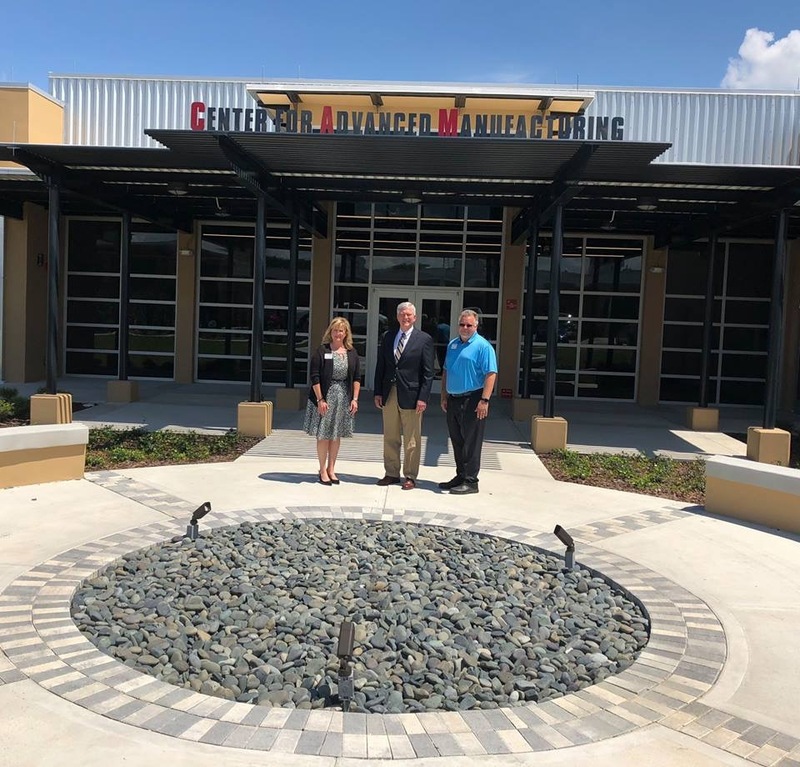 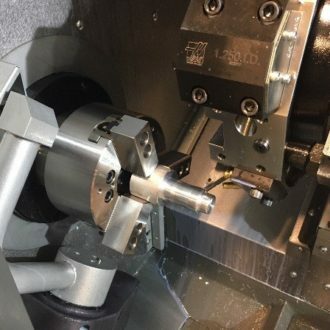 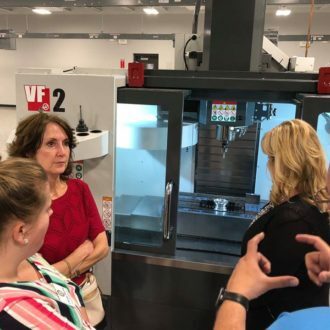 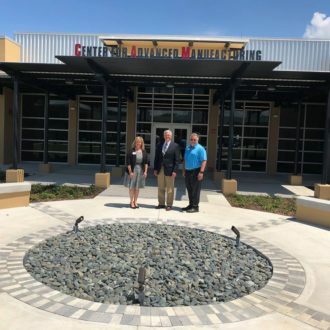 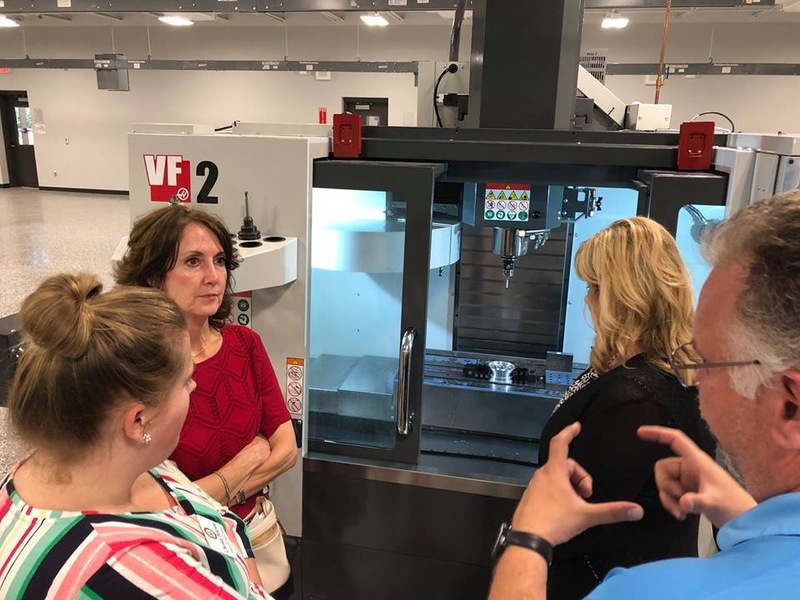 Diane Culpepper and Mark Crenshaw will be presenting an update on the Center for Advanced Manufacturing at the Leesburg Rotary meeting on April 25 at noon. 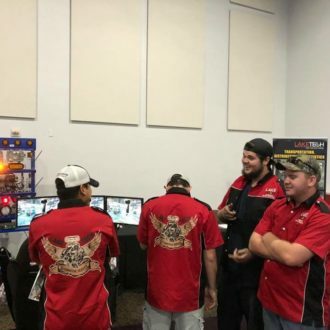 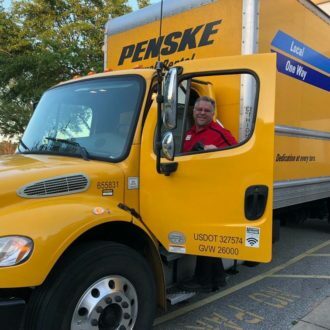 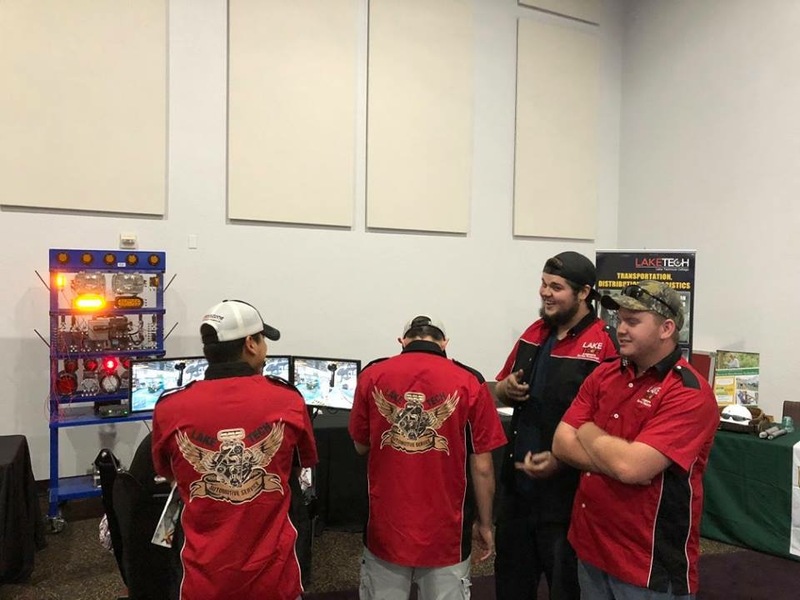 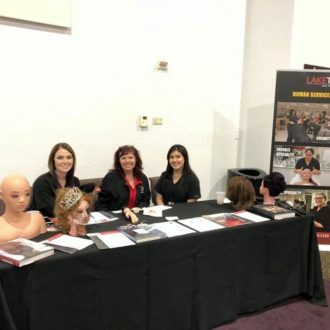 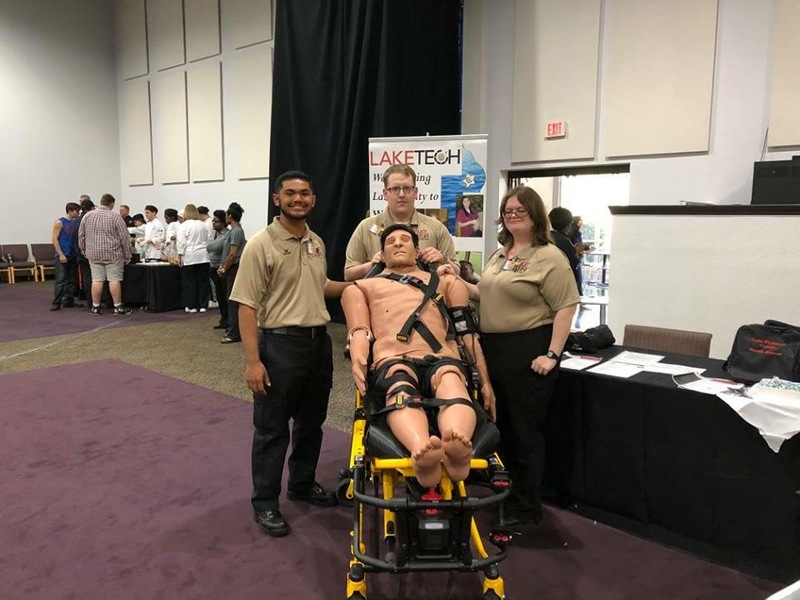 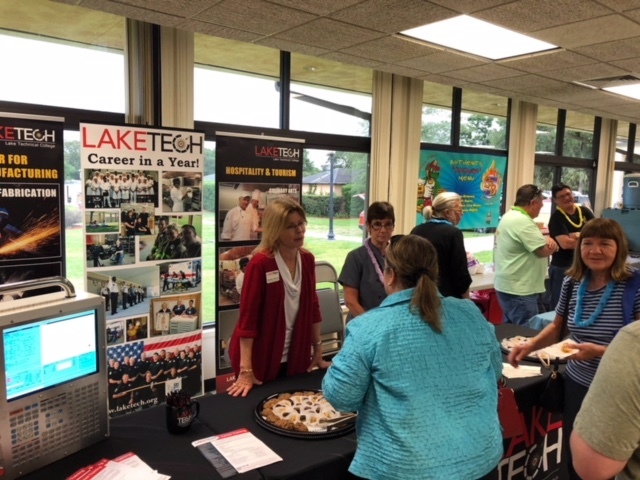 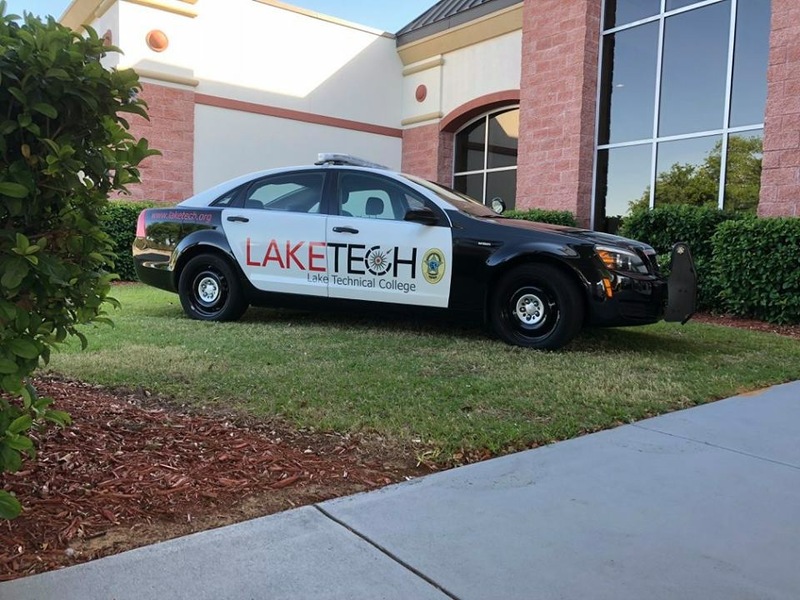 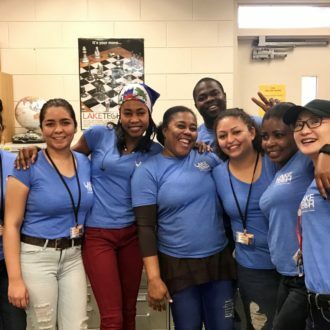 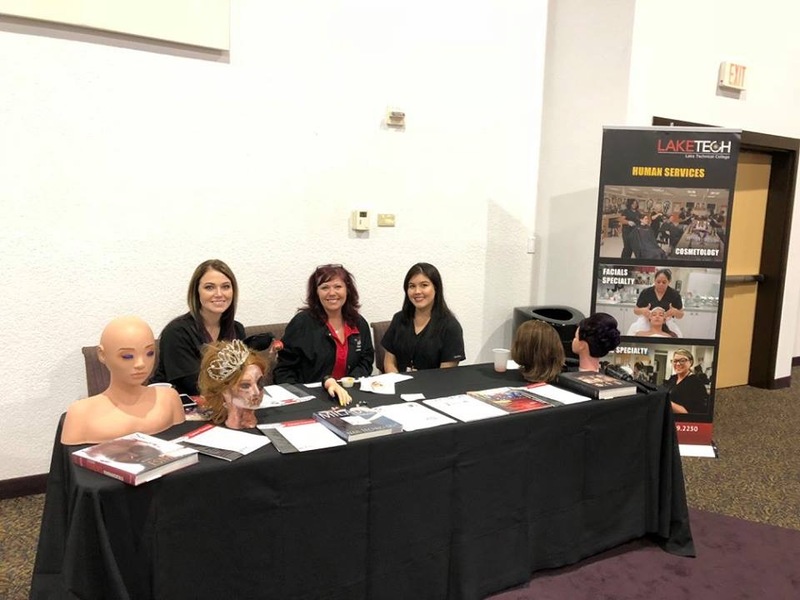 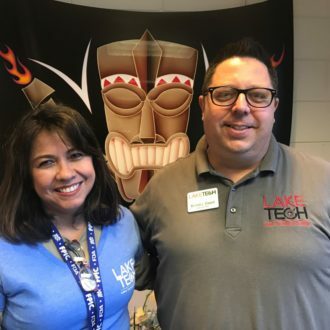 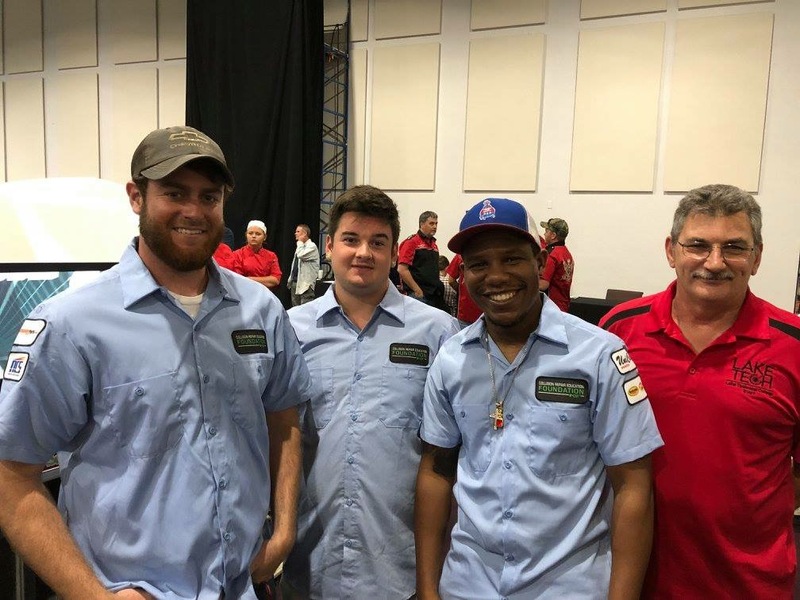 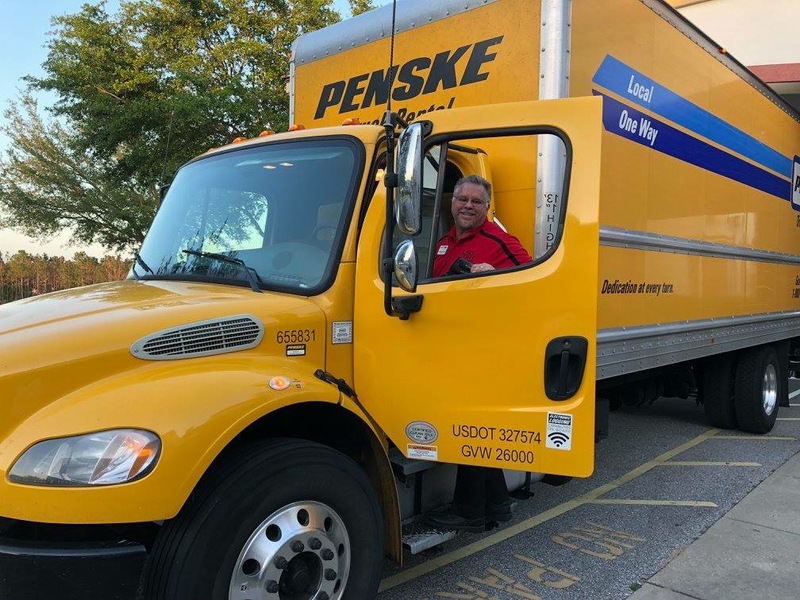 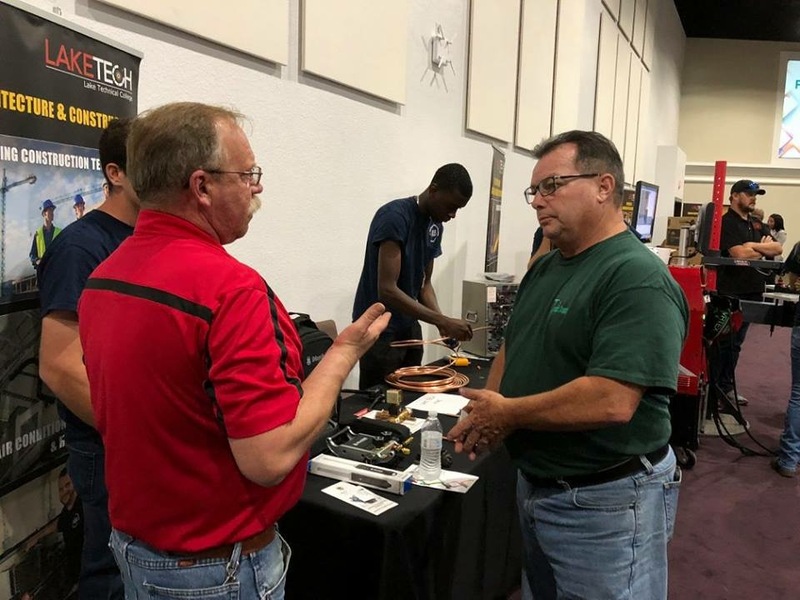 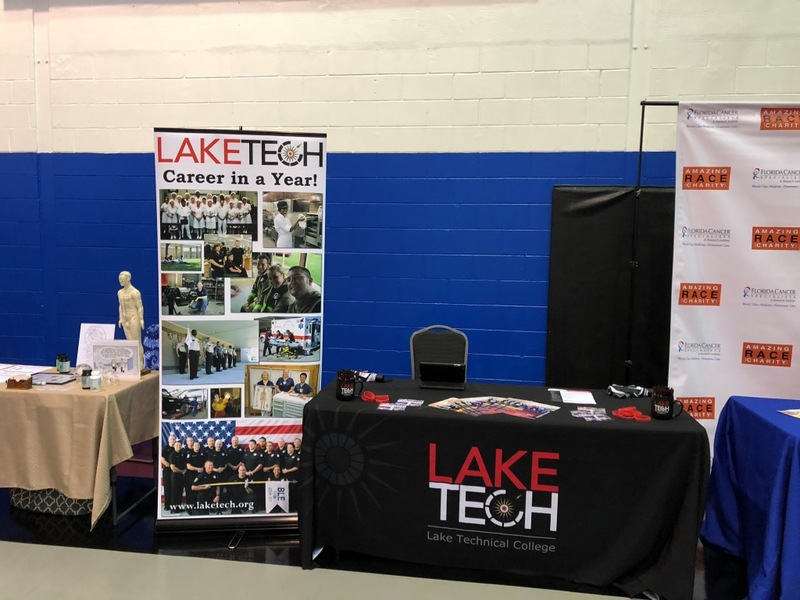 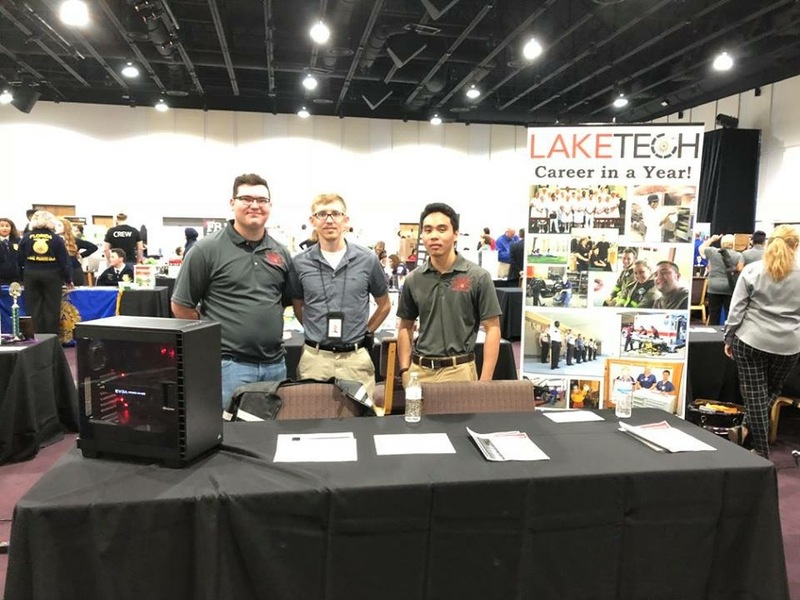 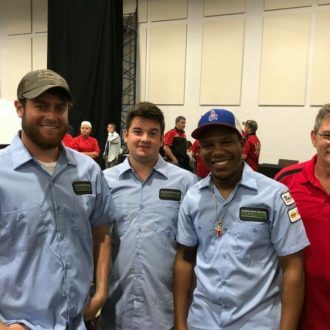 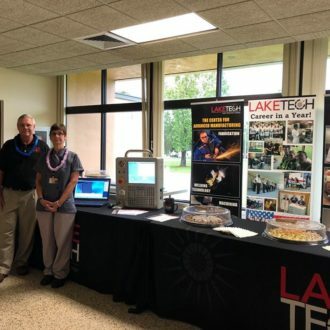 Lake Tech is a partner with the United Way through the support of the Correction Connection and through sponsorship of students enrolled in adult education or career tech programs. 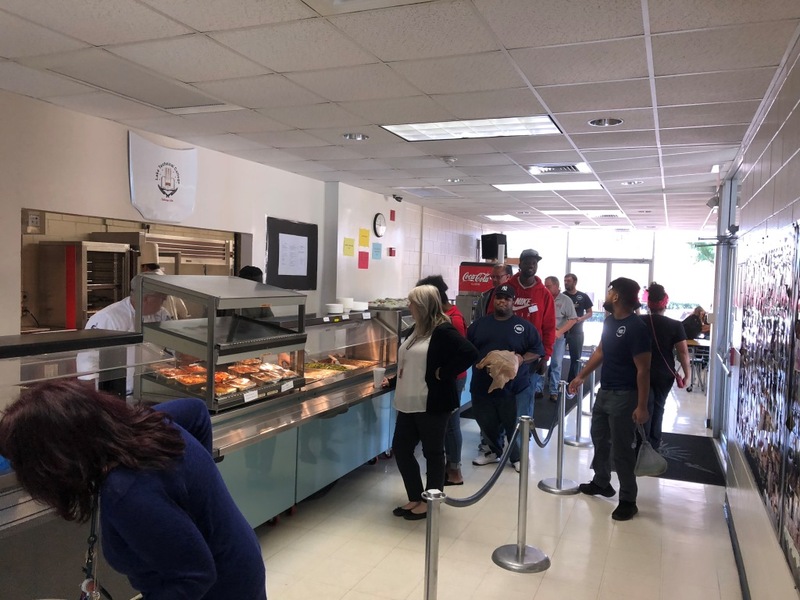 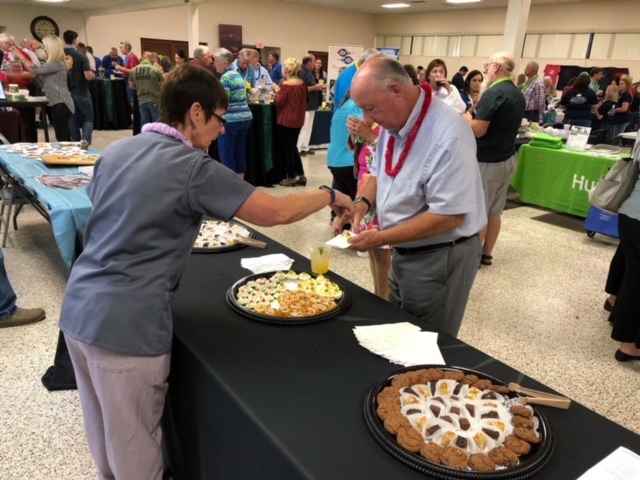 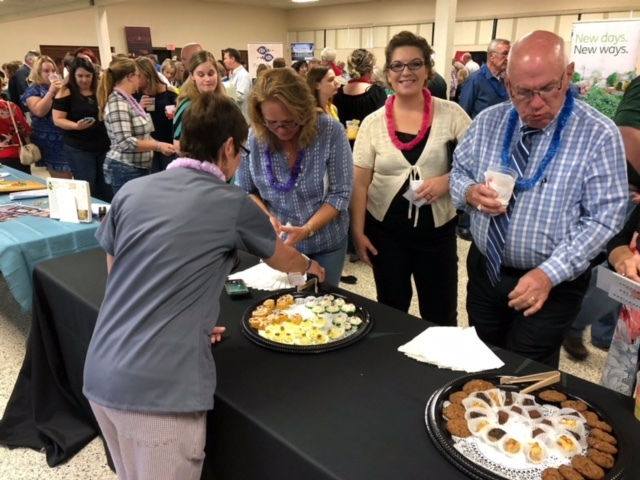 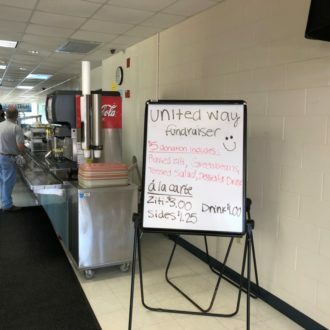 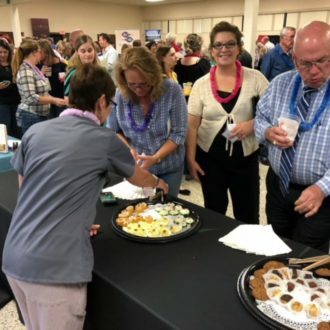 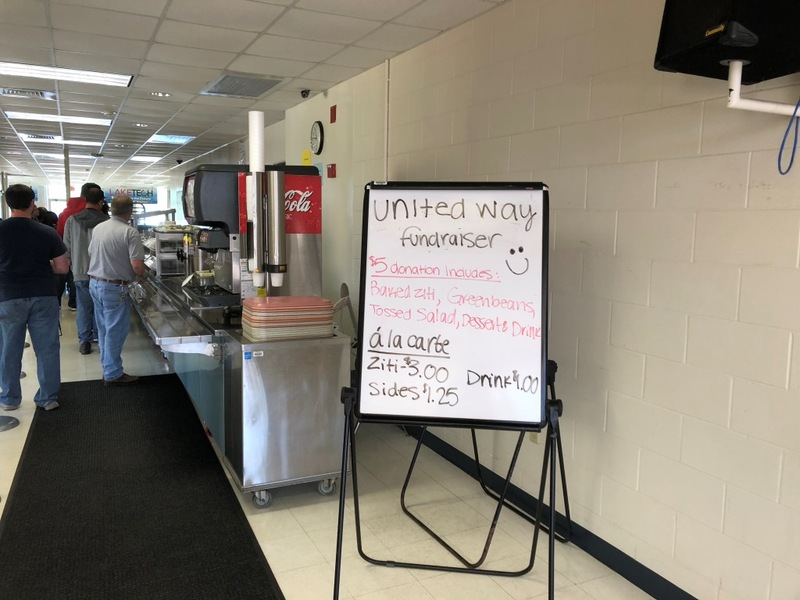 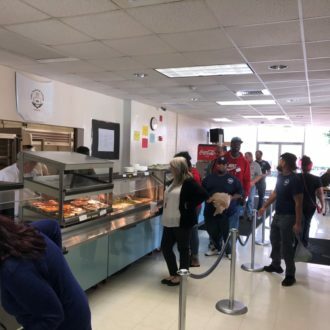 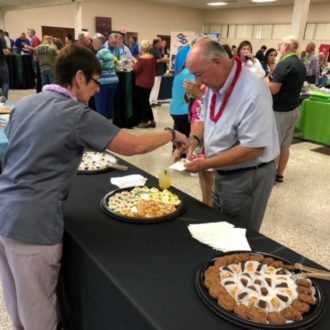 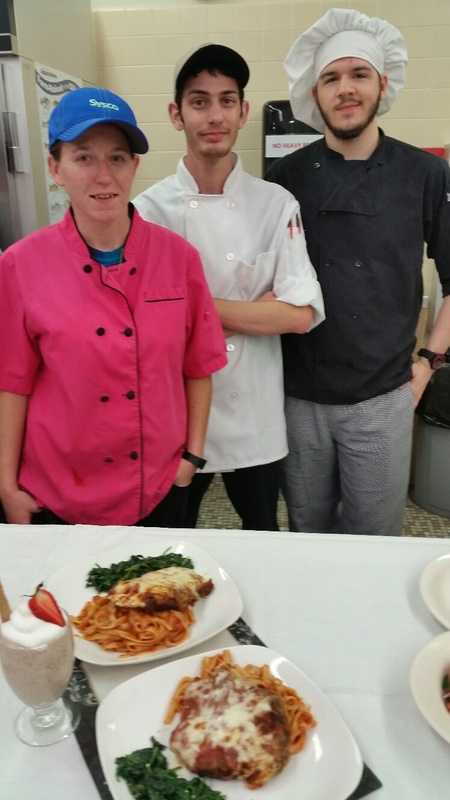 On Wednesday, April 18, the Culinary department prepared baked ziti, bread sticks, green beans, salad and desert and all proceeds went to the United Way. 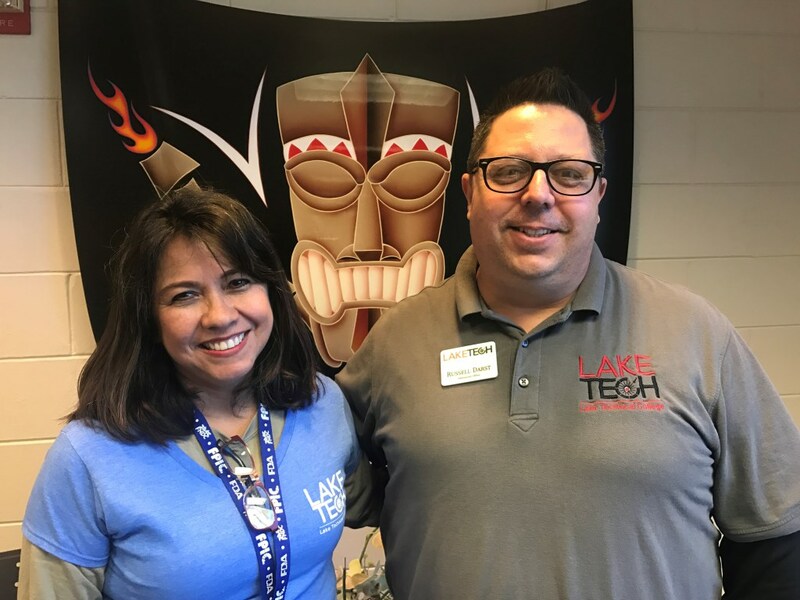 Congratulations to Megan Bateman, Lake Tech’s Support Person of the Year!